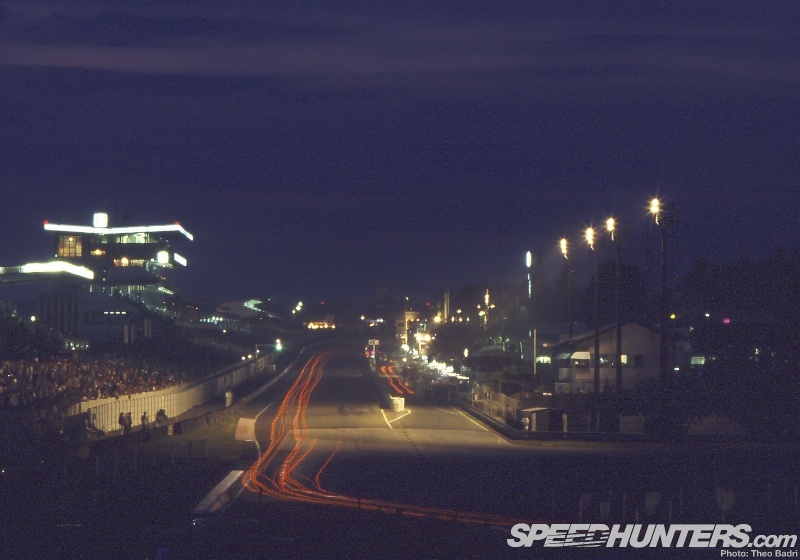 The Le Mans 24 Hours is part of the holy trinity of motor races alongside the Monaco Grand Prix and the Indianoplis 500. It’s the race that the drivers want to win – but more importantly, perhaps even more than the other two, it’s the race that the manufactures want to win. 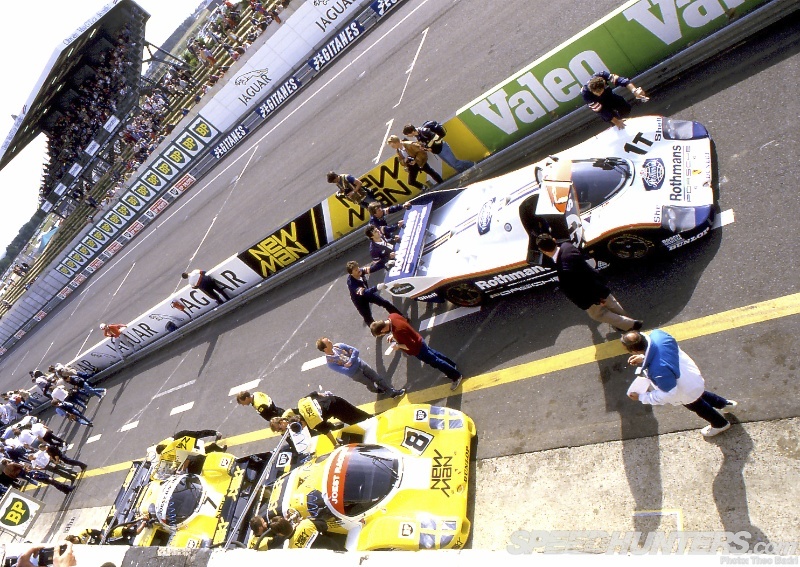 That’s why major automotive brands have been turning up in western France every June for the best part of a century: to pit their cars against not just the competition but the very concept of the event itself. 24 hours of racing. From the afternoon of the first day through the night till sunrise and morning – and then you would still have more than the length of a regular 1,000km, six-hour race to go. It’s always been the ultimate high-speed endurance challenge. 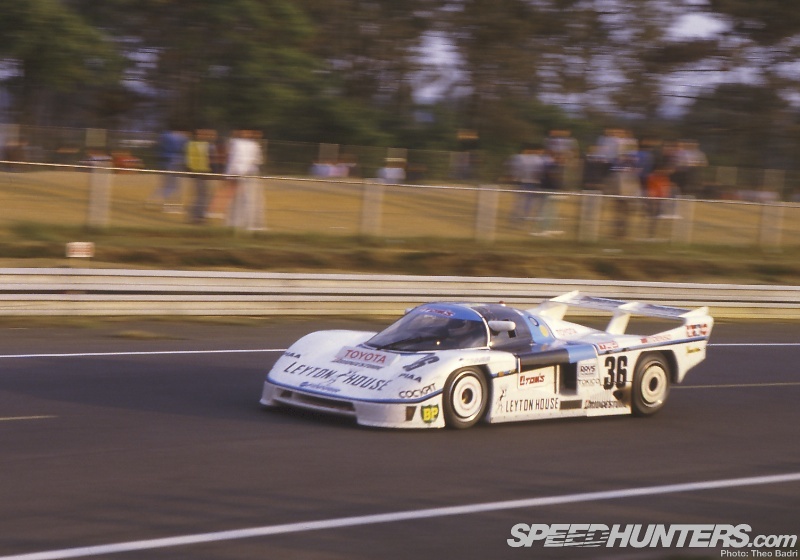 The 1980s was full of classic races at Le Mans, from the opening races of the decade and the final wins for Group 6 machinery to the later Group C years of uber-developed Mercedes and Jaguars against the ultimate Porsche evolutions. Every year threw up surprises, excitement – and often disaster. 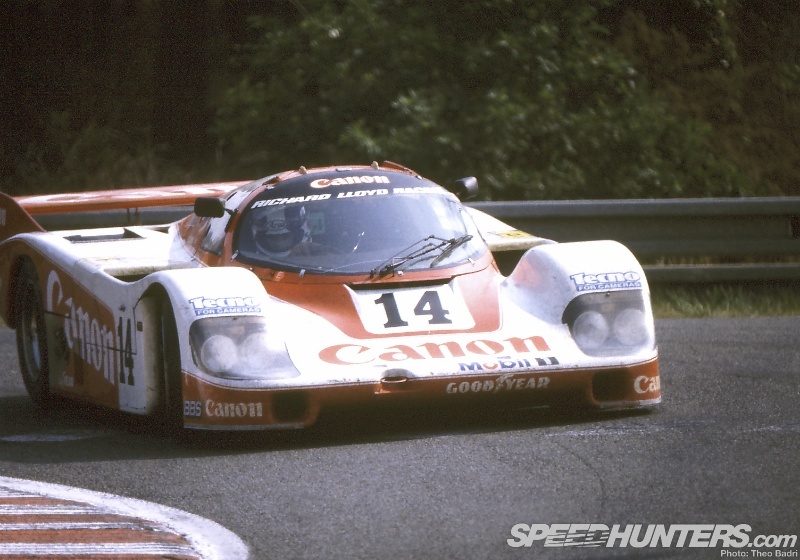 Speeds had grown exponentially, as had the popularity of the new Group C regulations. 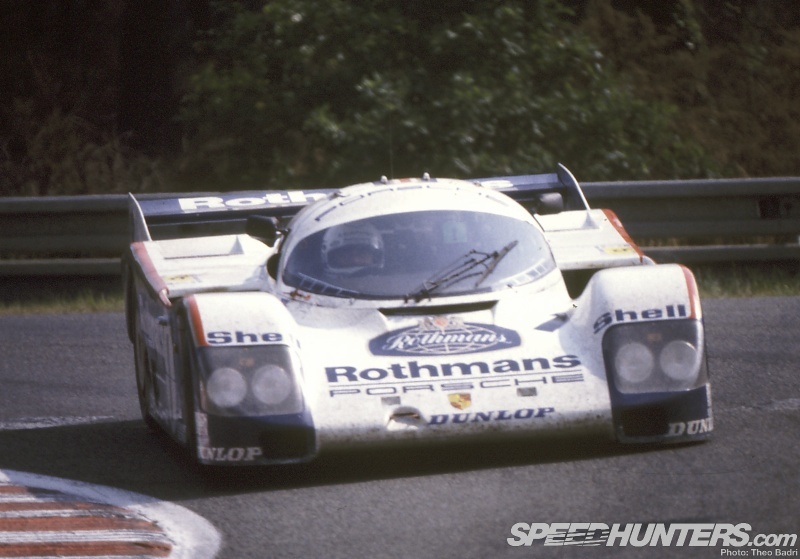 Grids had serious strength in depth, often comprised of just prototypes, and Porsche’s customer programme allowed swathes of privateer tuners to modify the new 956 and its later 962 derivative. It was a golden era for the race. 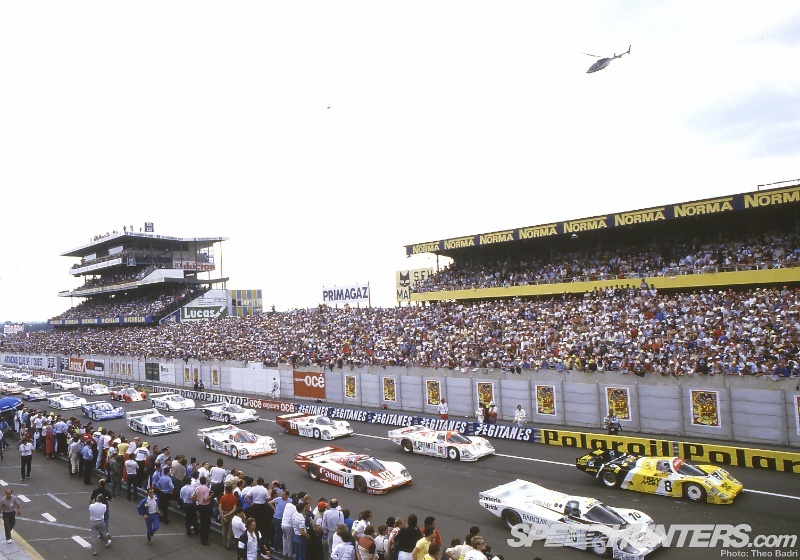 The 1985 Le Mans 24 Hours was a round of the World Sportscar Championship, then in its 33rd glorious year and a match for Formula 1 in terms of exposure and spectators. 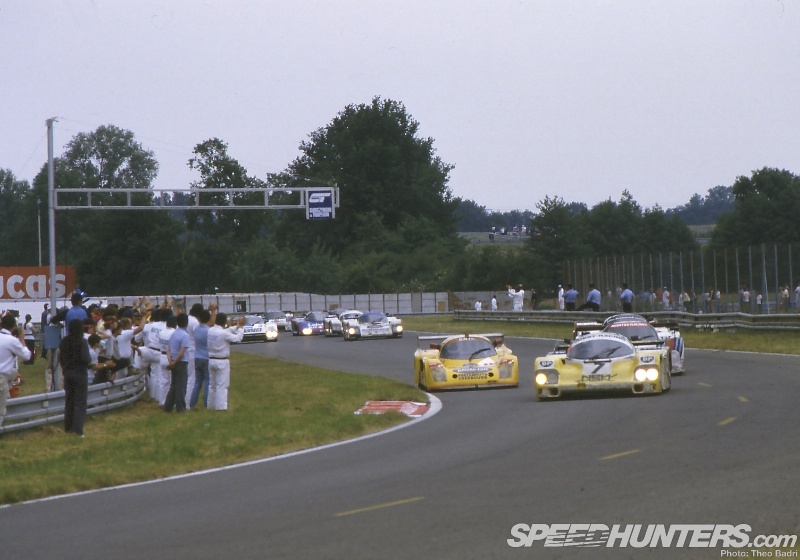 The 1985 season comprised nine races of the classic 1,000km distance (Mugello, Monza, Silverstone, Hockenheim, Mosport, Spa, Brands Hatch, Fuji, Shah Alam) plus Le Mans slotted in as the fourth round. 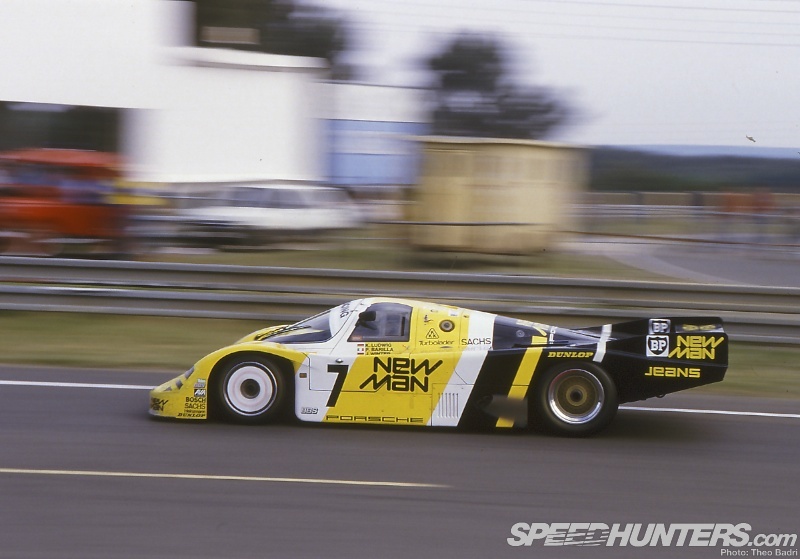 The opening race at Mugello in Italy had seen the debut of the new IMSA-spec Porsche 962C, the updated version of their dominating 956, in the hands of the factory and select privateer teams. Lancia were also back with a pair of new LC2-85s: as usual the cars were fearsomely quick but suffered now-traditional engine reliability woes. Pole fell to the Italian team – but the cars fell in the race. 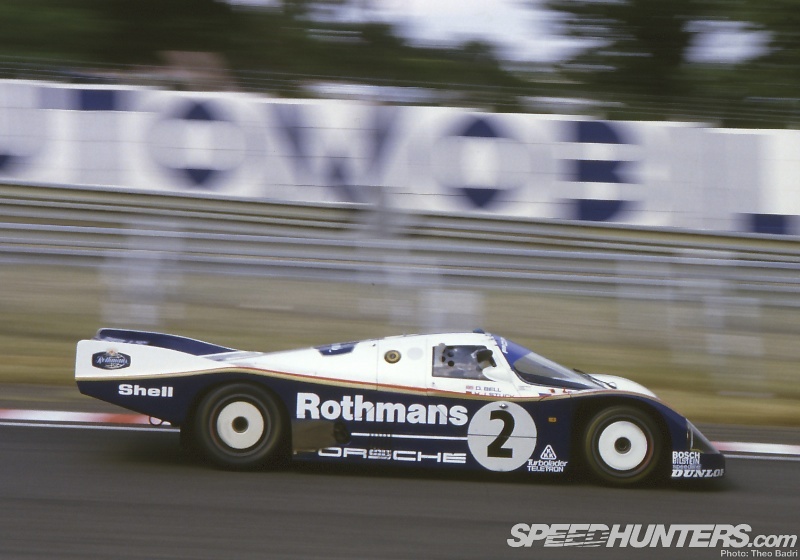 The lead Rothmans-liveried Porsche of Jacky Ickx and Jochen Mass took the win from the Manfred Winklehock/Marc Surer Kremer 962C. For Monza, the Kremer team’s 962C lifted the trophy ahead of Stuck and Bell and the Patrese/Alessandro Nannini Lancia, and at Silverstone’s third round the Lancias were even more rapid in qualifying, this time taking the top two spots: the stunning pole time of Riccard Patrese and Alessandro Nannini put them almost two seconds clear of the second place LC2. 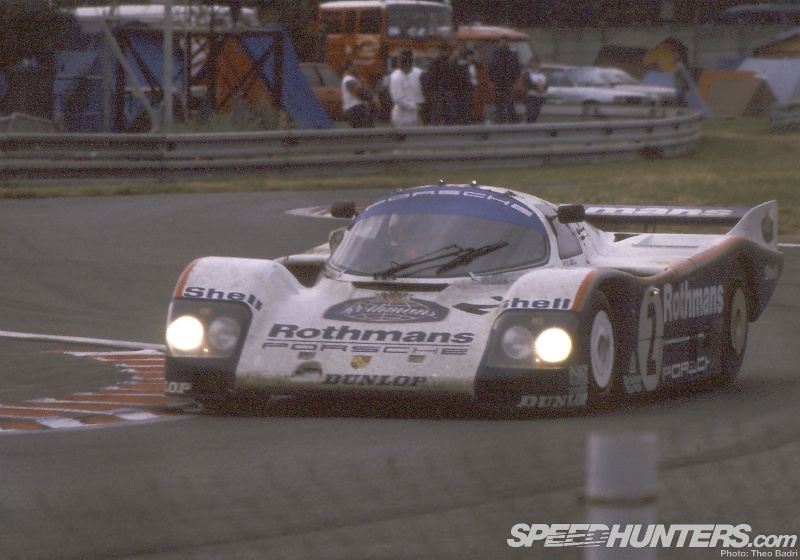 Porsche upped their squad to three cars; Derek Bell and partner Hans Stuck reverted to an older 956 for the race, out-qualifying the 962C but finishing second to Ickx/Mass in the race. 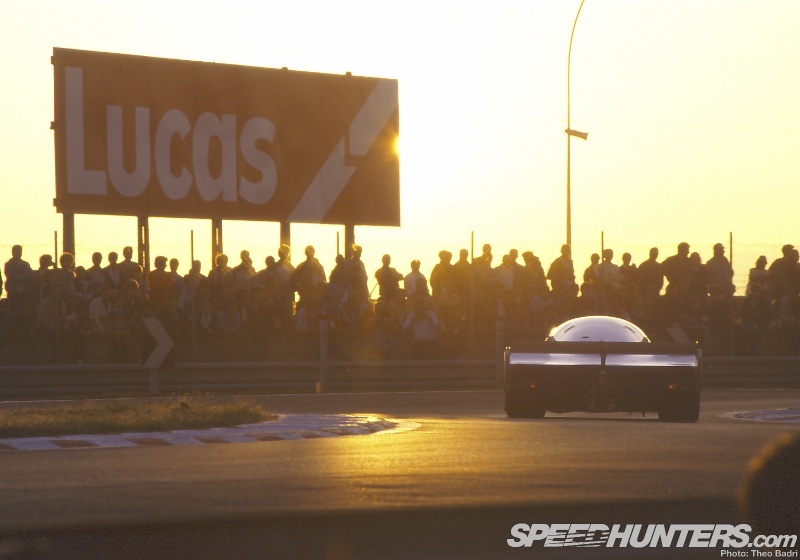 But all eyes were on the prize: the Le Mans 24 Hours. 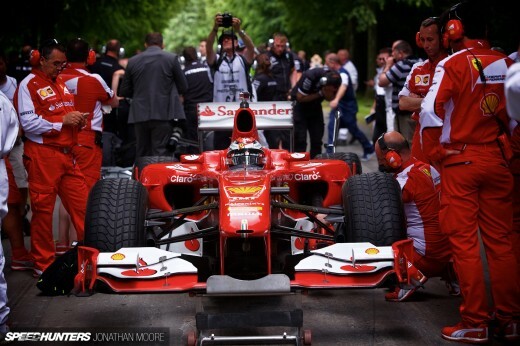 Taking up its traditional slot in mid-June, a massive 81 cars were put forward for the 55 grid slots on offer. 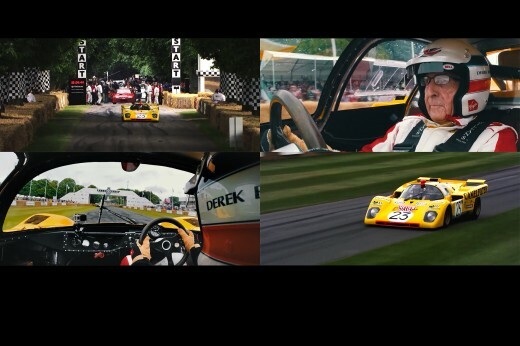 ‘Tous contra Porsche’ said the posters – ‘Everyone versus Porsche’ – and it was difficult to disagree. 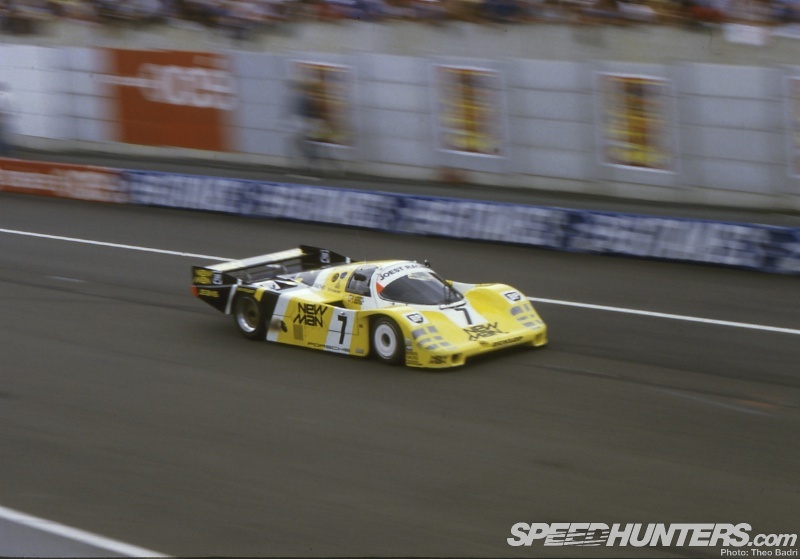 Porsches had taken victory at Le Mans five times runnings since 1981, and there was nothing to suggest that the success wouldn’t continue with the new 962C. 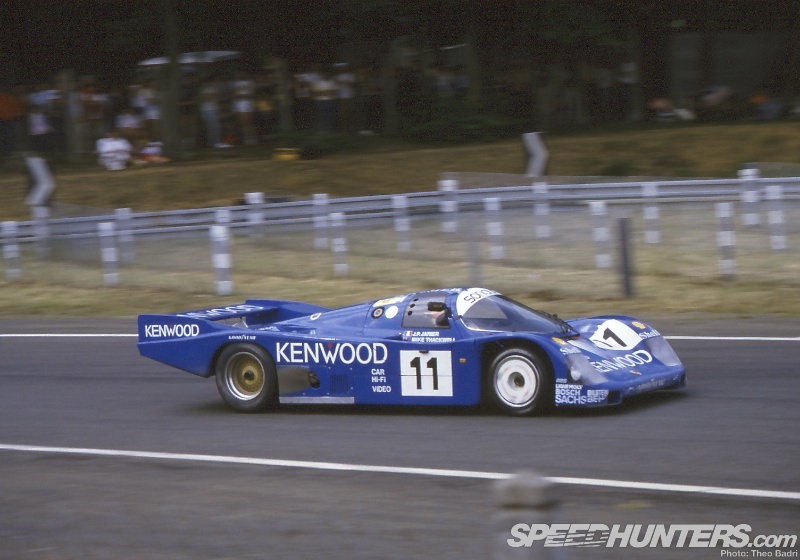 Fuel economy would be the biggest question mark hanging over all the teams: the Group C regulations were written around that concept, with a set quantity of fuel available to the teams. 24 hours of racing meant over 3,000 miles to complete compared to the normal distance of around 600, so the strategists and engineers had a lot of work to do with their calculators and early computers. Microchips had replaced carburettor specialists for the first time in the works squads: a precursor of the future. That meant optimising cornering and braking performance: the fastest speed down the Ligne Droite Des Hunaudières would count for nothing if your car was out of gas very 45 minutes. But as ever with Le Mans, the most important thing would be about keeping time in the pits to an absolute minimum. The track itself had a very different look to today’s facility at La Sarthe, which continues to see changes and modernisation every year. Although the general layout would seem familiar to today’s drivers, the feel of the environment was completely different, as was the surface. 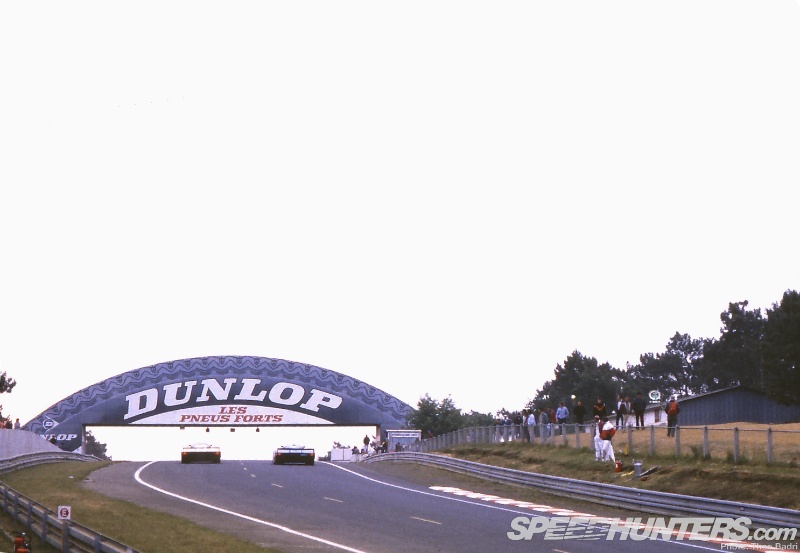 The sweeper up to and arrow-straight drop from Dunlop to the Forest Esses presented an iconic image of Le Mans that came to define the race; the ultra-fast Indianapolis corner had far more pronounced banking at both entry and exit; lines of chicken wire were all that stood between cars, the low barriers and the fans in many places; marshals, photographers and cameramen stood virtually out in the open. The 8.5 mile circuit had none of the facilities and wide open spaces you see now, with its enormous run-offs and gravel traps. 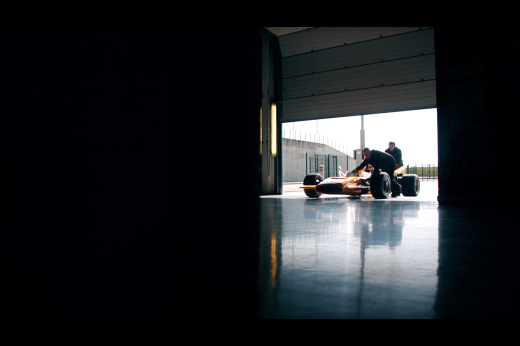 Space in the pits was a terrible problem: the old pit buildings were totally outdated and nowhere near big enough to accommodate the new generation of long, sleek cars even nose to tail. The forest encroached right to the edge of the track, which for the majority of its length ran down a claustrophobic tunnel through the trees. Where there weren’t trees there was the crowd: hundreds of thousands of fans packed every space around the track, lining the fences and hanging from any vantage point. 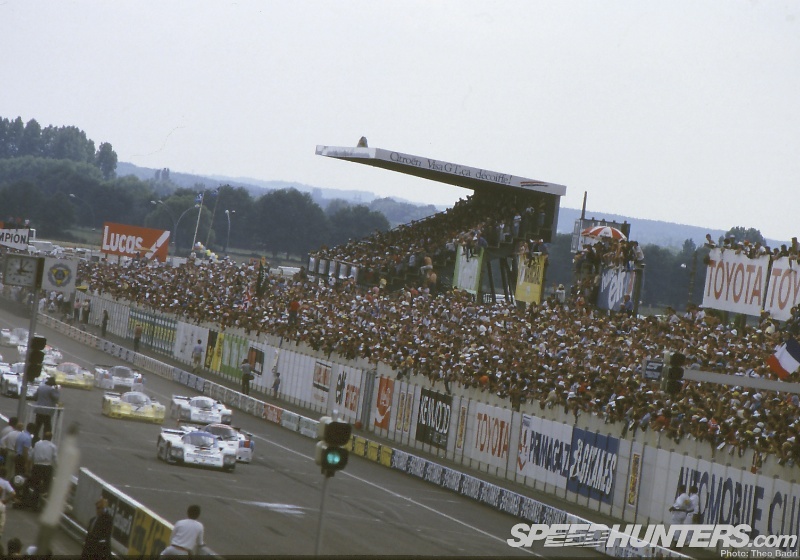 A sea of people that started in the tribunes along the start-finish straight and only ebbed away as the track entered the long straight to Mulsanne. 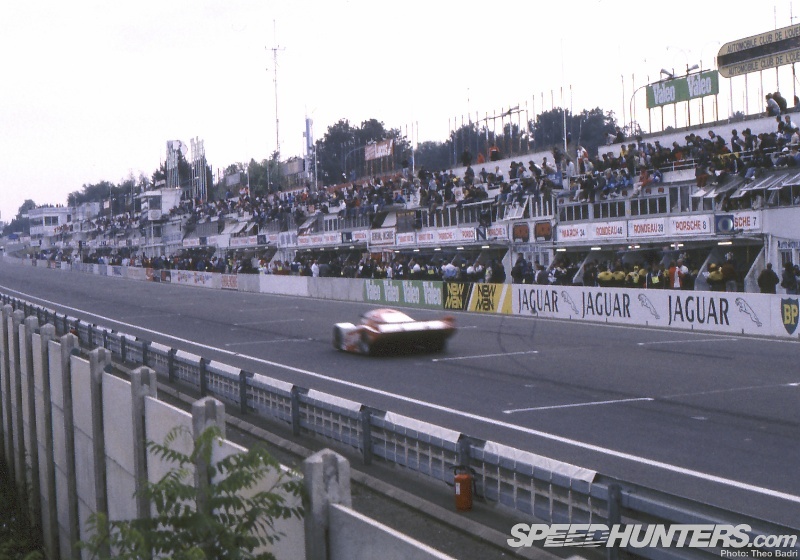 In those days the straight was still mostly open to the public, protected only by a thin double-strand of Armco. There were no chicanes yet, meaning that the velocity down this sinuous ribbon of tarmac was unabated for three and a half miles. 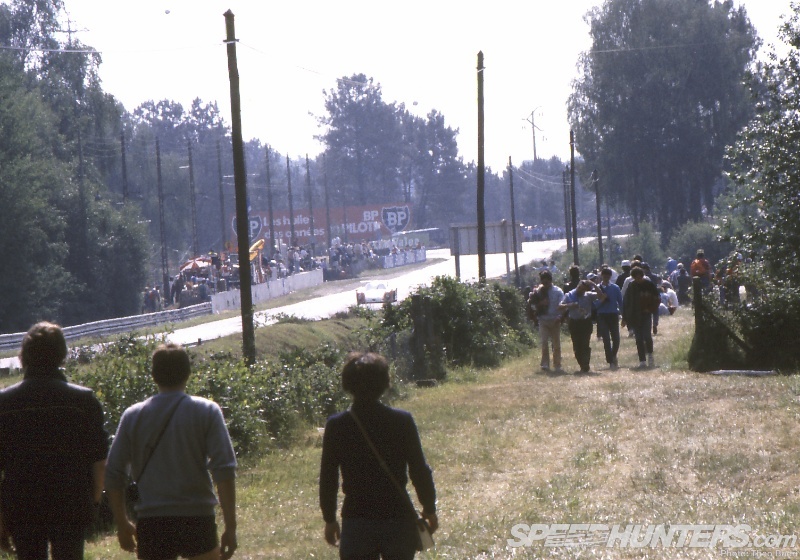 With rough gravel at either side of the track and ruts down the middle, Hunaudières wasn’t for the feint hearted. Put together obscene speed differences between cars, the bumpy track, the infamous Kink and the long hump before Mulsanne corner and it didn’t seem like a place to be relaxing for any driver with sense. After four days of rigorous technical inspection it was time to get out on track. 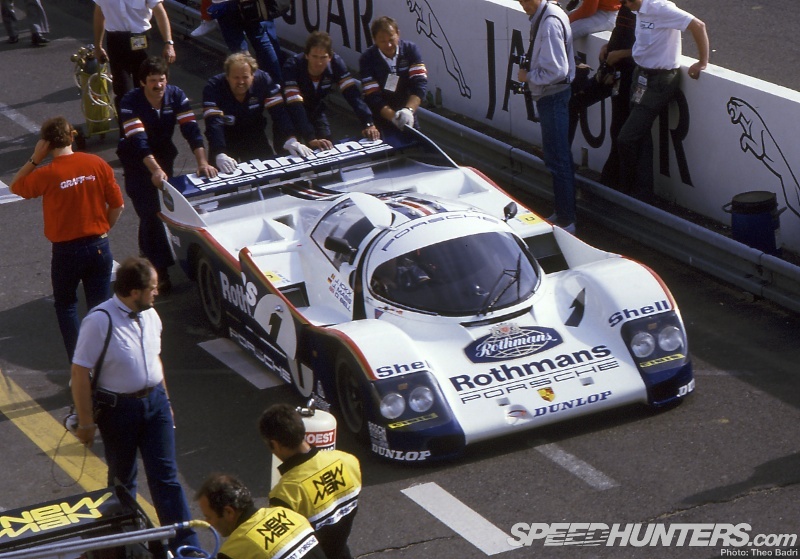 The Porsche factory fielded a trio of new 962Cs, and four of their seven drivers already shared 11 victories at Le Mans between them. 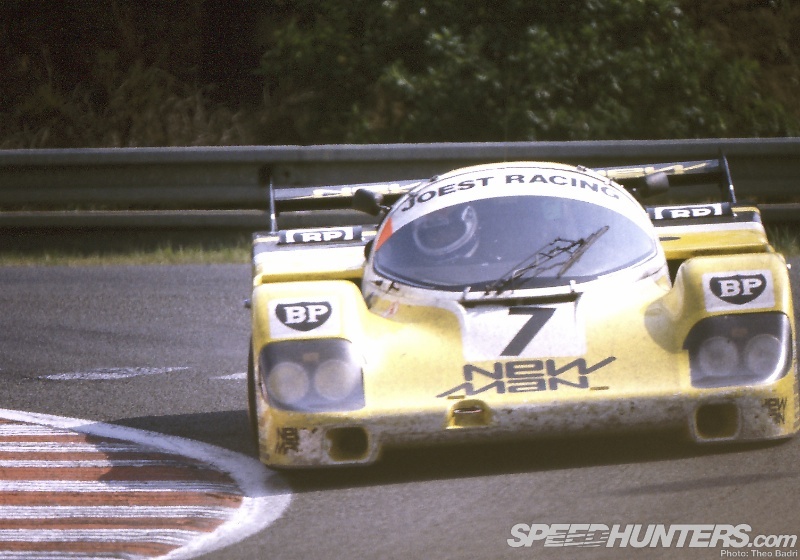 Six-time winner Jacky Ickx continued his partnership with Mass in #1, as did Bell with Stuck in #2; F1 race-winner John Watson drove #3 with ’83 Le Mans victors Al Holbert and Vern Shuppan. The rules of the time allowed drivers to swap once between cars, so Bell and Ickx were listed as third drivers for #1 and #2 respectively. The #1 and #2 962Cs were fitted with new three-litre twin-turbo qualifying engines on Wednesday, as #3 was the only car new for the race. It was the first time the cars had been seen with the Langheck, low-downforce bodywork, which was also available to customer cars, and smaller 16″ rims were fitted. 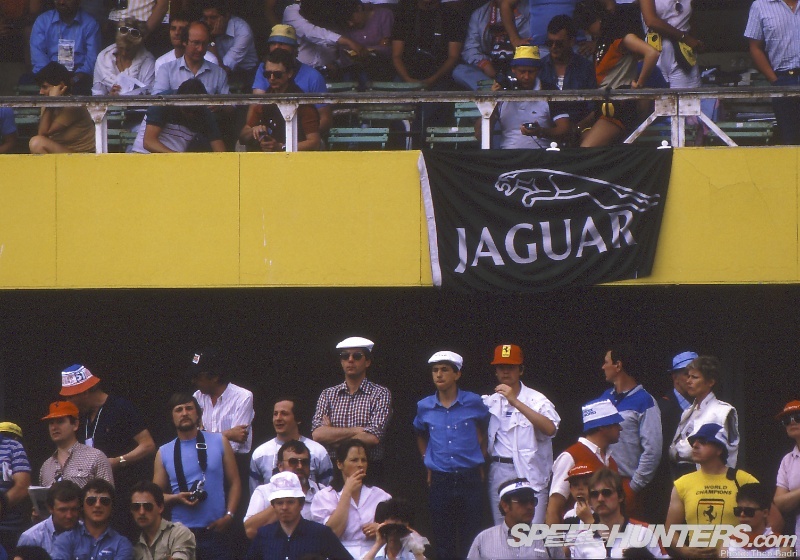 The posters might have rightly seen Porsche as the main protagonists, but the official programme featured the Jaguar team on the cover, now in their sophomore year. The Big Cat came along with huge patriotic support from the legions of Brits who would cross the channel for the race – although the base team was actually American, having been put together by Bob Tullius’ Group 44 squad. Qualifying didn’t demonstrate a big step forward: both XJR-5s suffered blown pistons and the #44 suffered a tyre deflation at speed – something guaranteed to get your attention at Le Mans. 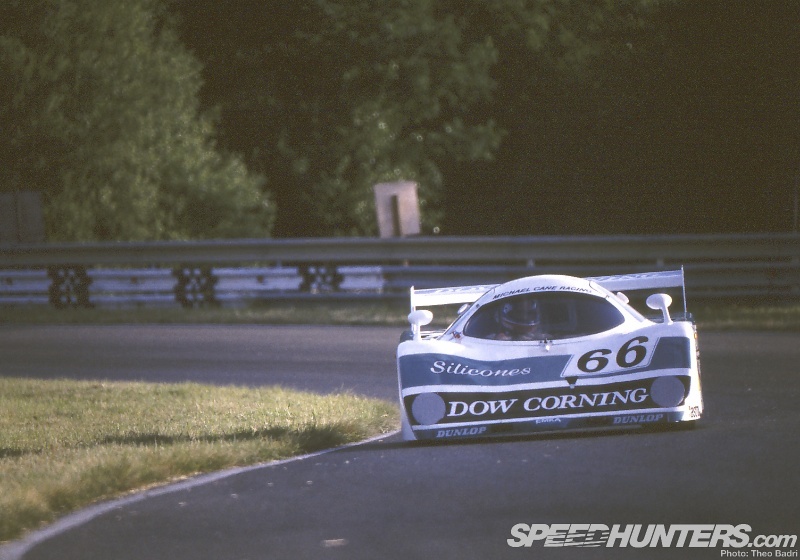 The Jags qualified with 3m35-7s laps, 20 seconds off the Porsche’s pole time and more what the 962C was expected to run at during the race… Fuel economy might win them back time over the race, but Jaguar would have to push hard from the off, and push hard. 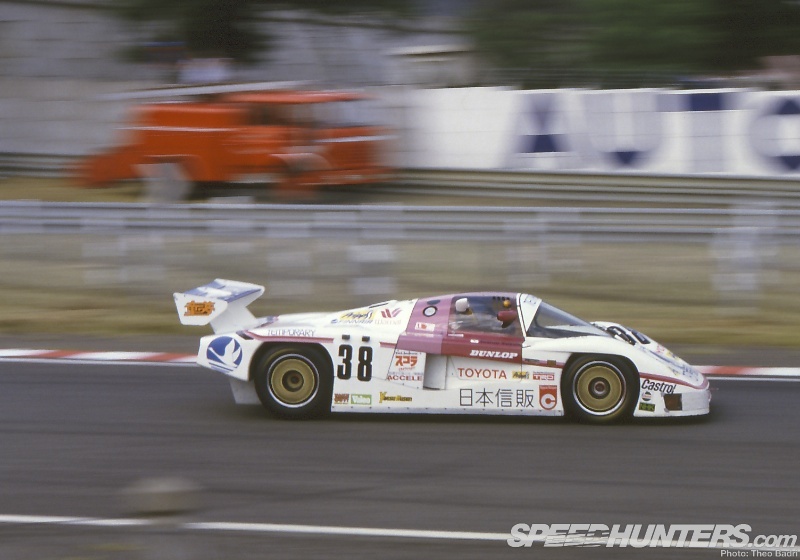 1985 also saw Toyota step up to an official factory programme for the first time: they’d been competing in the Group C rules All-Japan Endurance Championship with Team TOM’S, and now brought two Dome 85Cs to the Circuit De La La Sarthe with one all-Japanese (#36) and one intercontinental crew (#38) – Satoru Nakajima, F1 driver and father of Kazuki, was on the roster for #36. The 85Cs initially suffered from a worrying tendency to want to pivot around the nose – on the straights. A result of excessive front downforce, this was improved with a bodywork change, but that just highlighted the car’s other weakness: its engine power. 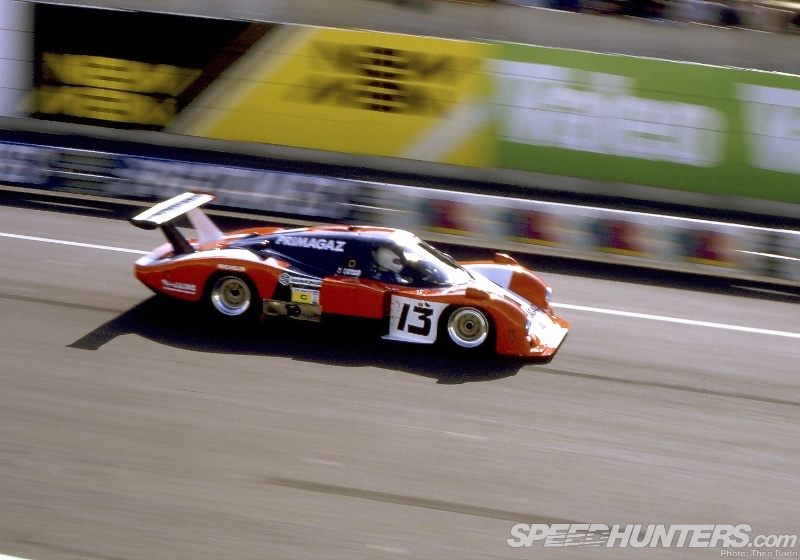 The straight-four 2.1-litre Twin-Cam turbo only developed 550hp and would be no match for the other C1s, not even breaking the 200mph barrier and meaning they qualified 30 seconds off the leaders’ pace. Finishing would be the team’s goal, ahead of what it hoped would be greater things as the project evolved. Porsche backed up their own effort with a phalanx of privateer entries: seven 956s plus three 962Cs. The Kremer and Brun teams each ran one 956 and one 962 and were expected to be strong. 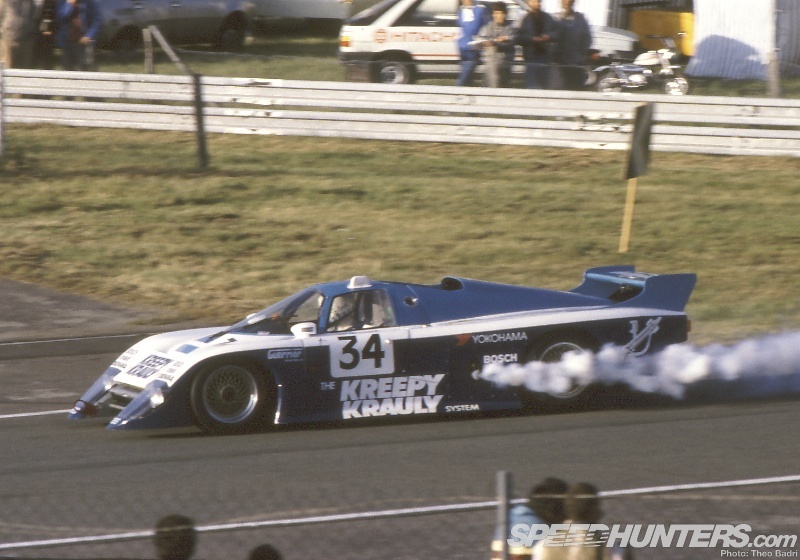 Kremer as usual ran their own development parts on their Porsches, most interestingly an upright stabilising fin along the rear bodywork, several decades before they’d be mandated on modern prototypes. 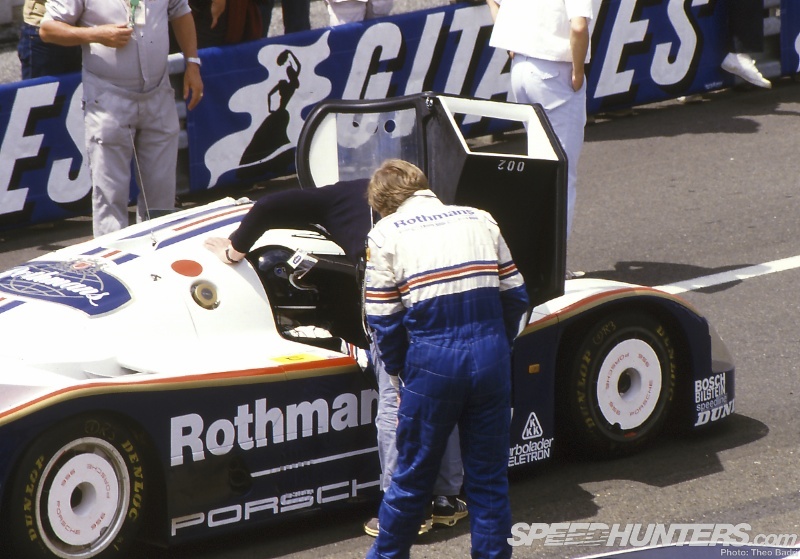 However, the drivers in the 962C reverted to the standard, larger surface area rear wing for the race. 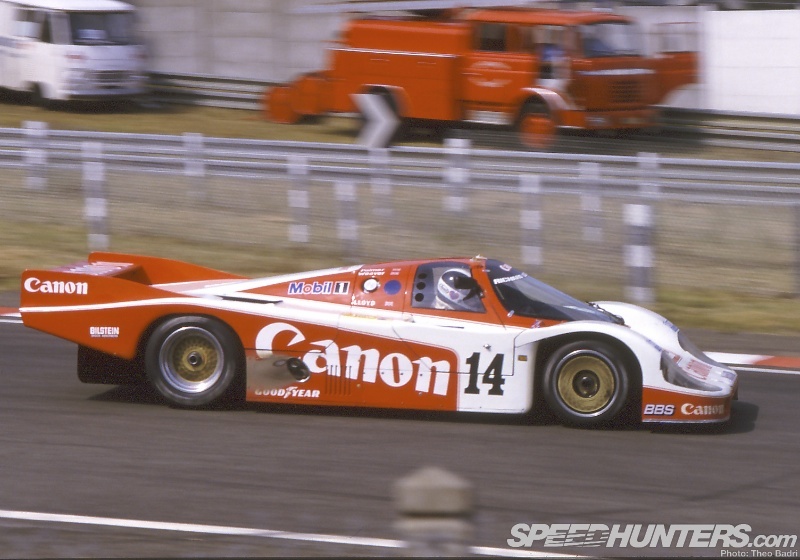 But the money was on the British #14 Canon 956 of Richard Lloyd Racing (using their bespoke honeycomb chassis and underbody) and the Joest-run pair of New Man-sponsored 956Bs running their own development engines – specifically the #7 car containing Klaus Ludwig, who had won the ’84 race in the same chassis. 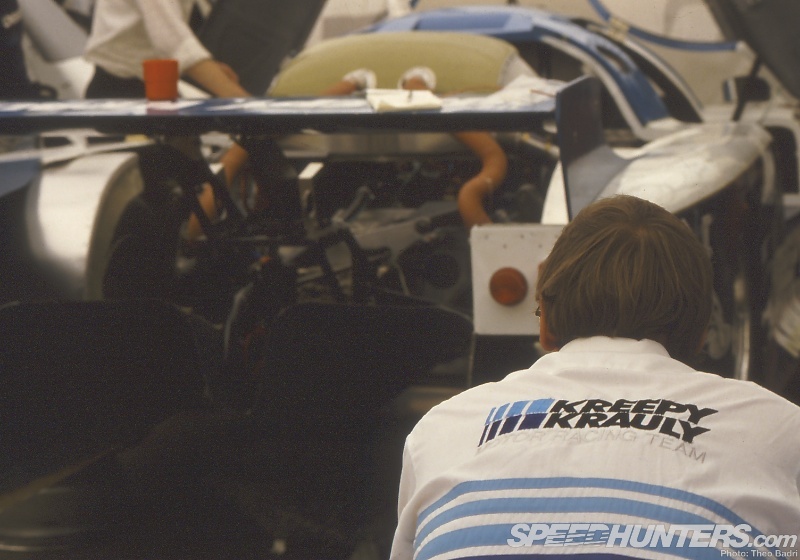 An eclectic mix of privateer manufacturers bolstered the rest of the C1 grid: the Porsche-powered (mounted horizontally) Kreepy Krauly March 84G made its European debut and was considered a dark horse if it opted for a fuel economy run, though like the Jags it was considerably overweight. 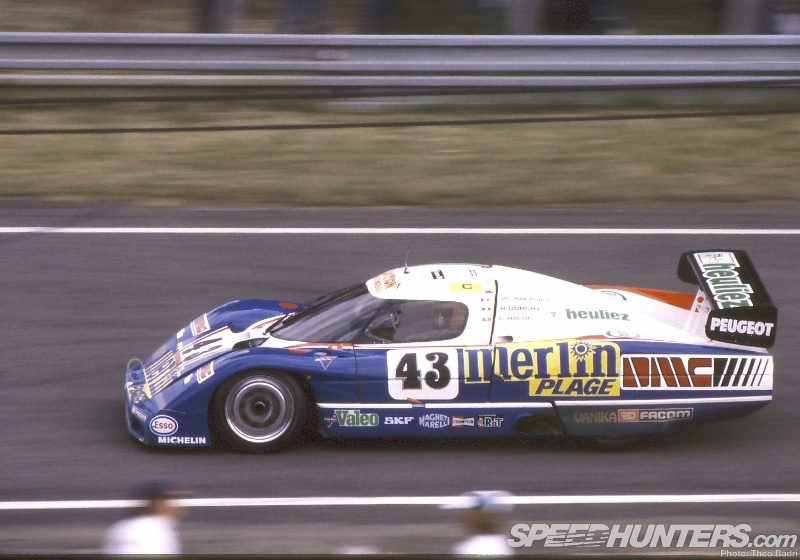 The British EMKA C84/1 Aston Martin was also expected to be quick – definitely the the quickest NA car overall in race trim and on the pace of some of the turbo cars – and was regularly close to the factory cars in practice, nine seconds faster than its 1984 times. But with pro driver Tiff Needell backed up by two solid but amateur drivers, 24 hours of on-the-edge racing was likely to be a challenge. Another team making their debut was the Swiss Sauber squad. 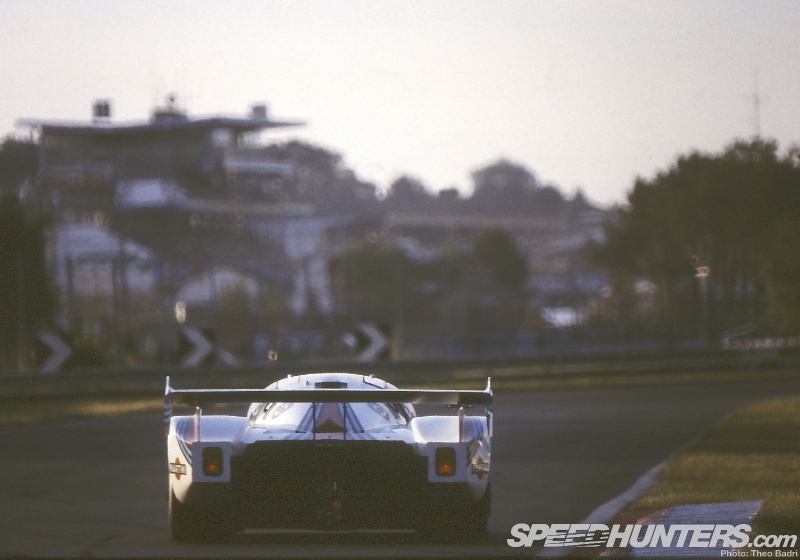 Whereas Toyota would come so close but never really achieve over the coming decades, Sauber really were on the cusp of greatness during the early Group C era. The C8 premiered with a Mader-tuned, five-litre twin-turbo Mercedes-Benz engine – its customer support from the factory a precursor to their eventual participation. #61 was fast as well, with 700hp on tap and a top speed of 221mph (second fastest through the speed trap in Wednesday practice), the potential was obviously there and it qualified a solid 20th amongst the Brit factory cars and privateer Porsches. But disaster was ahead – the car flipped at the Mulsanne hump and was completely destroyed, taking the car out of the race but thankfully leaving the driver uninjured. Local colour was added by a trio of WM-Peugeots using V6 engines. 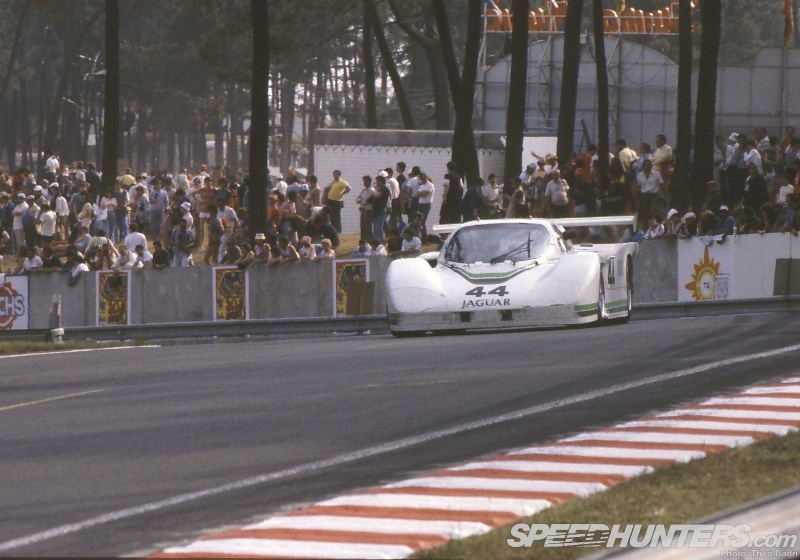 Jean Rondeau in #42 had even led the race the previous year – before an embarrassing crash early on at Mulsanne corner. 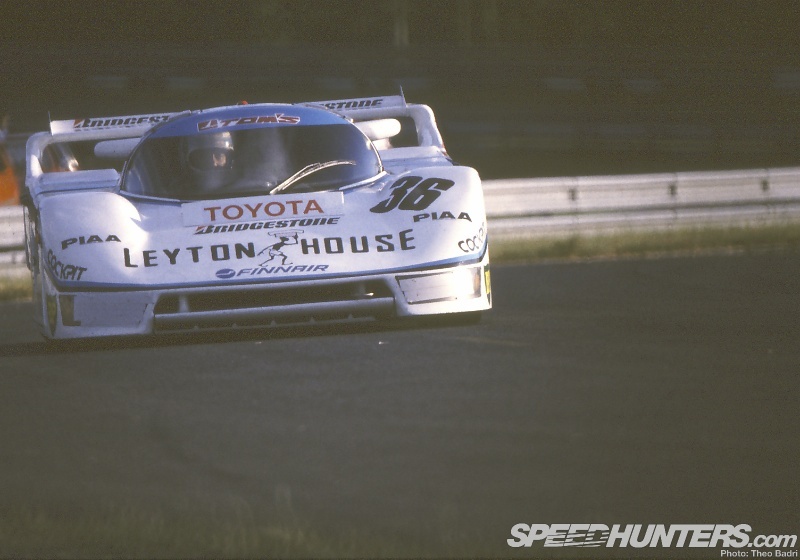 But in 1985 the cars’ pace was missing because of a newly installed fuel injection system and aero-tuning issues, and the cars would be make-weights at best. The team itself was a fan-favourite with the locals though, due its all-volunteer French crew. Similarly, a quartet of cars bearing Rondeau’s name were also entered. Two M382s, #31 and #39, ran next to a pair of M482s. #46 and #67. 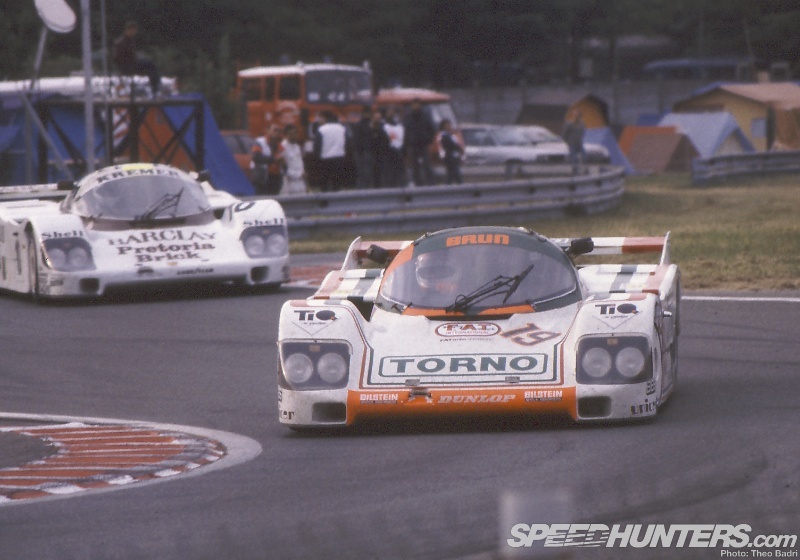 The single car entries of Cheetah (the Aston-powered #24 that had already suffered an impressive 16 starter motor failures that year) and Cougar C12 (#13, powered by a Porsche 956 engine, which hammered down to Mulsanne at an impressive 231mph top speed – the fastest since 1978) completed the C1 field. The ‘baby prototype’ C2 class was expected to be fought out by the British Ecosse team in #79 (the winner at Silverstone) and the Spice Tiga, which had seven straight victories leading up to the race. Three different Italian Albas (AR2, 3 and 6) and some other C2s were bolstered by another factory toe-in-the-water: Mazda returning with factory-supported 737Cs, #85 and #86. 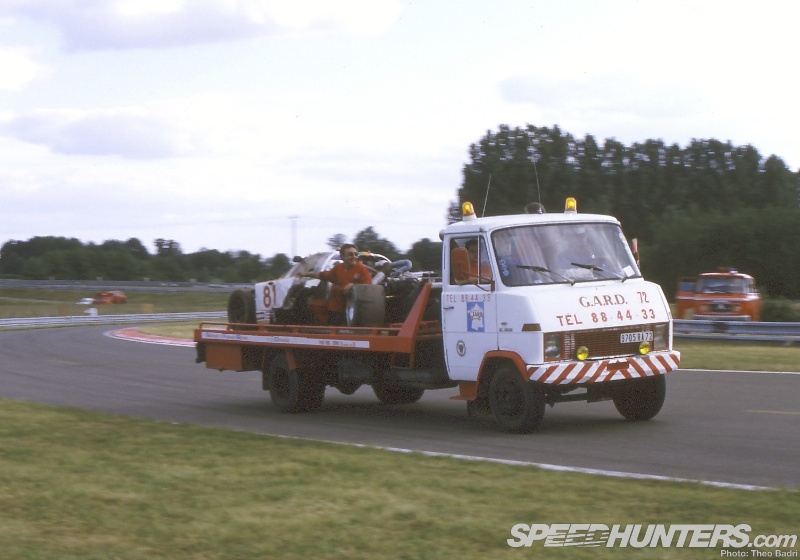 British driver John Sheldon was driving one of the C2 Gebhardts, back at the race despite a horrific accident the previous year. His Aston Martin had hit the barriers on the Hunaudières straight, utterly destroying the car, and then had the misfortune to be hit by his team-mate as well. A marshal was killed and another injured in the accident, which reminded everyone of the respect the track still demanded. With that fresh still in people’s mind, the worst was feared when a similar accident happened during Thursday practice. 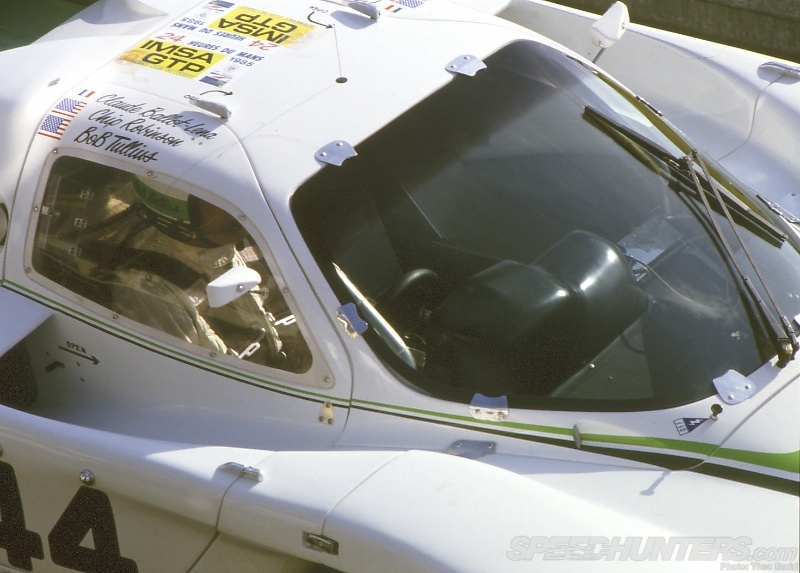 In the first minutes of the session British driver Dudley Wood in the brand new Fitzpatrick Porsche 962C collided with Swiss driver Jean-Pierre Frey in a C2 Alba AR2 at almost the same place, whilst travelling at over 200mph. It was like an aircraft crash: both went over the barriers and into the trees. Over 80 metres of barrier were flattened and the impacts were so hard that the Porsche’s engine block was cracked open. Virtually nothing was left of the cars, but amazingly no one was killed. As a result, neither car started the race and the number of cars scratched from the starting list grew. 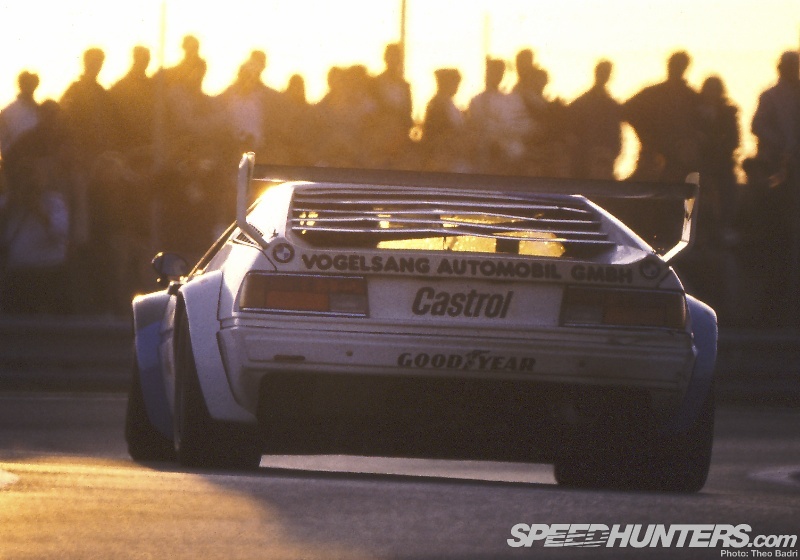 A trio of GT cars had squeezed onto the grid: Group B regs cars that were in most cases faster than the tail-end C2s – especially the trio of big-engined BMW M1s. A solitary Porsche 911SC qualified at the back of the field, one of 57 cars to take part in practice. 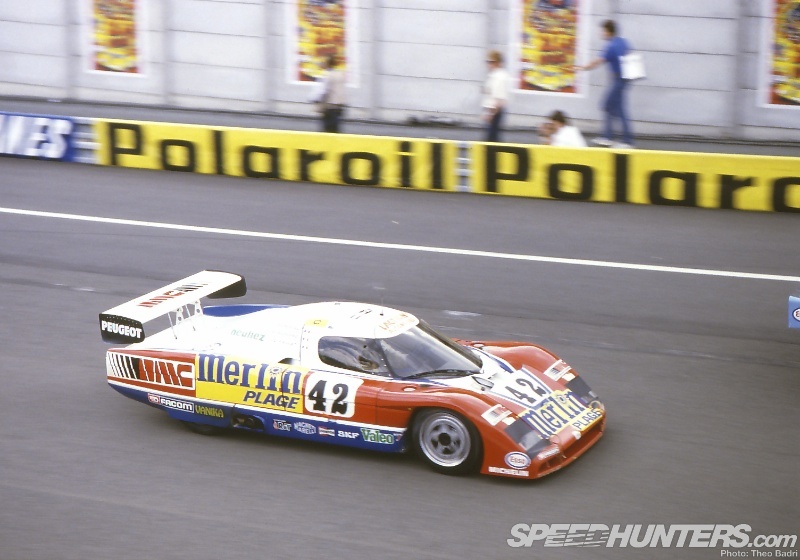 It had been excellent weather at Le Mans for the third year running: the top three cars had shattered the lap record set by Ickx the previous year and the Stuck/Bell 962C took pole with a 3m14.8s lap – an average speed of 156.47mph. Stuck set the time despite boost issues losing them some top-end revs, and the time put them half a second ahead of the #1 Ickx/Mass car. 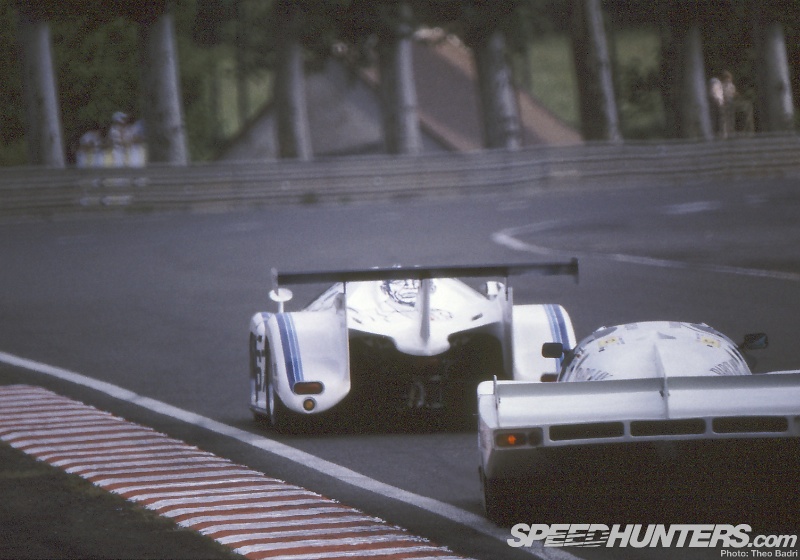 Despite the promise, the Wollek/Nannini/Cesario Lancia LC2-85 would line up third, another half a second back, having been through a factory’s worth of Michelin qualifying tyres. They’d also bolted on low-drag qualifying bodywork with bulbous noses, but were still 6mph down on the Porsches and 15kg heavier. The #7 New Man 956 qualified just a hundredth back in fourth (Ludwig was only given a single set of Q-tyres), with #3 fifth followed by the second Lancia and New Man cars. For Thursday most teams worked on installing race engines and set-up for the 24 Hours itself – T-cars were used for banzai laps, but the Wednesday times stood. Friday, as usual, was a rest day ahead of the main event. Raceday warm-up was uneventful, and with six minutes to go until the 3pm start the grid was released and the 49 starters made their way round to take the start. 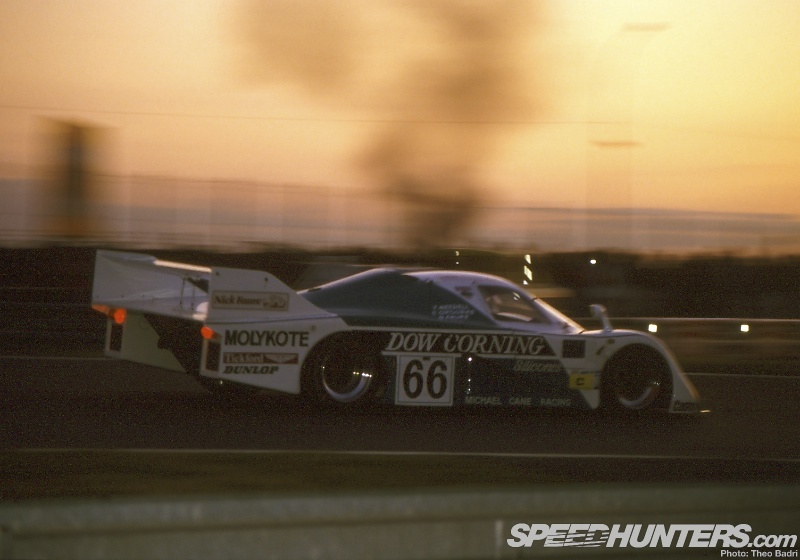 As the cars came through the Ford Chicane and the pace car peeled off, Wollek cranked up the boost in the Lancia and shot through to take the lead by the first corner, taking Bell on the the outside line up to Dunlop. Positions kept changing as the cars fired downhill, and the #7 New Man Porsche was into second by Esses, with the Kremer car up to fourth from seventh at the rolling start. 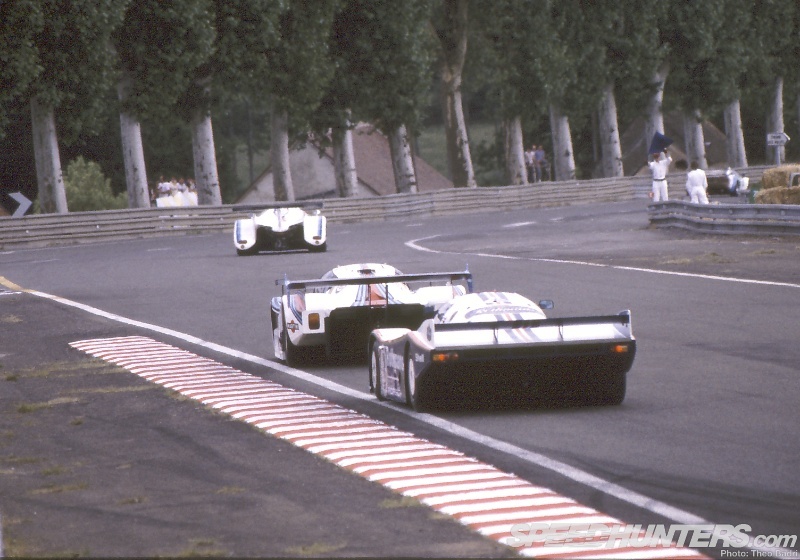 The cars rounded Tertre Rouge and headed down to Mulsanne for the first time. Watching the cars approach, the leading C1 cars blasted along in a big pack, a gaggle of midfield privateers slightly in arrears, with the classic Porsche throaty air-sucking roar a counterpoint to the screaming Aston and Jaguars, 20-plus cars slipstreaming along at 220mph, with the C2s fighting their own battle a hundred yards back. By the Mulsanne corner the Kremer Porsche was up into third, and slightly further back the EMKA Aston was also making good progress. Conversly, the factory Rothmans Porsches, seemed to be slipping backwards: #2 was down to fourth at the end of the first lap, and then fifth over the line. The factory cars seemed to be resolutely sticking to their strategy, not distracted by the high-speed fight ahead. Up front, Wollek was being chased hard by four privateer Porsches, with Brun and Palmer’s Canon Porsche joining the fight. 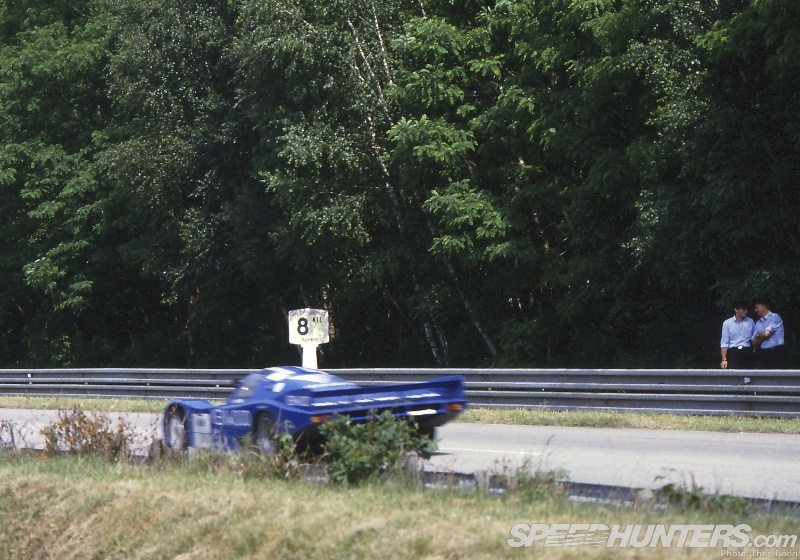 But by lap four the #7 Ludwig New Man 956 overcame Wollek’s defences, and the Lancia rapidly began to lose places. Maybe the pace was just too hot even for the LC2? 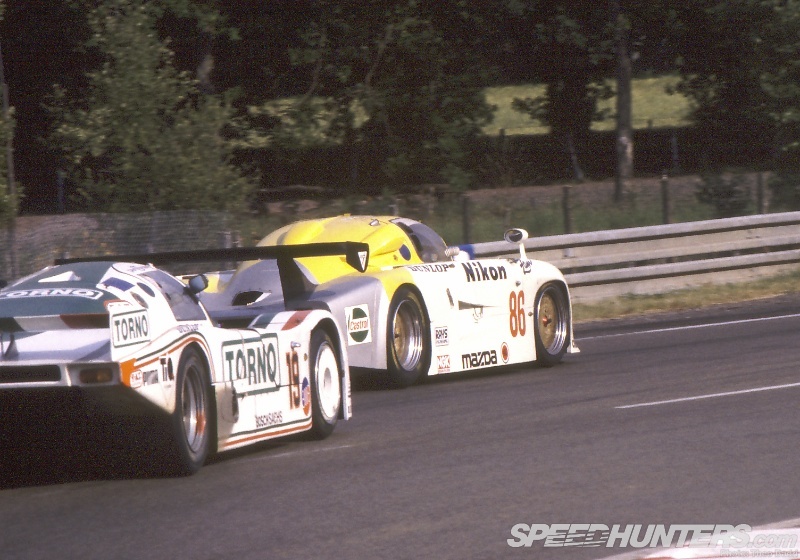 The privateer Porsches continued the fight, now with Jonathan Palmer in the Canon 956 duelling with Ludwig: neither seemed to be concerned about fuel efficiency at this stage. Palmer grabbed the lead; the factory 962s were all hovering around the top 10 mark after first hour, with Ray Mallock the clear leader in his C2 Ecosse. The wedge-shaped EMKA Aston continued to do well: they were fourth early on, then up to third using all its power on the straight and nose to tail with a pair of 956s. 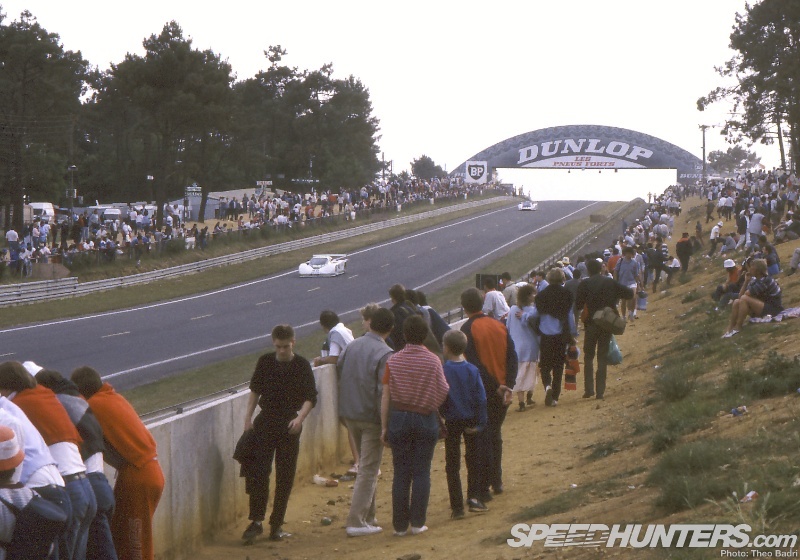 They decided on an early pitstop and short fuel-fill to try and leapfrog the leading Porsches ahead of flood of first stops: it paid off and an Aston Martin led at Le Mans for the first time since 1959. Behind them the pit lane became chaos as cars started to dive in: #2 and #3 came in together, you could barely see the tarmac of the narrow pitlane for people, and marshals opened up exit lanes for the cars by pushing back the crowd with ropes. The lead continued to go back and forth between Palmer’s Canon and Ludwig New Man Porsches over the first couple of hours, with Oscar Larrauri’s Brun 962C also in the mix. An early casualty was the Kreepy Krauly March: replacing a broken injector lost it an hour, and the leading cars also had to face up to reality. The teams had been allocated 4.3 times the amount of fuel normally allowed for a 1,000km race (2,210 litres), and the current pace would be five times that… Maybe the factory Porsches circumspect approach had been correct? By early evening the Rothmans cars had begun to reel in the leaders, with #2 up to fifth and number #3 into eighth and soon running together on track. The Jags were also looking strong, just outside the top 10 and the EMKA Aston, and the first 14 cars were still within two laps. But then Porsche suffered their first major set-back: Mass brought #1 in with gearbox issues, losing a lap, and then was back in again just a couple of laps later with a split oil pipe, meaning another lap lost. The car would continue to suffer gear selection problems from then on, and in the third hour fell even further back with a faulty spark box. One factory Porsche down? Five hours in, Paolo Barilla in the #7 New Man Porsche held the lead, a lap up from James Weaver in the Canon 956, with the lead Lancia third followed by the #18 Brun, #2, #19 Brun and #3. Third to seventh were on the same lap, though two laps off the leading pair. Just after 9pm one of the WM-Peugeots crashed on Hunaudieres, victim of a tyre failure through the notorious Mulsanne Kink, triggering a safety car. It would be the first several dramas during the seventh hour. 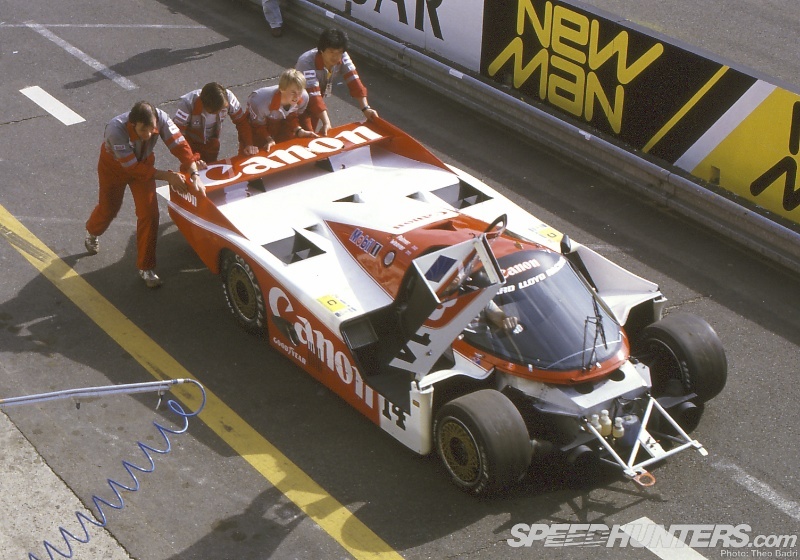 Ickx had been setting fastest laps on his recovery drive in #1, only to then return to the pits with oil cooler problems that required a gearbox change. 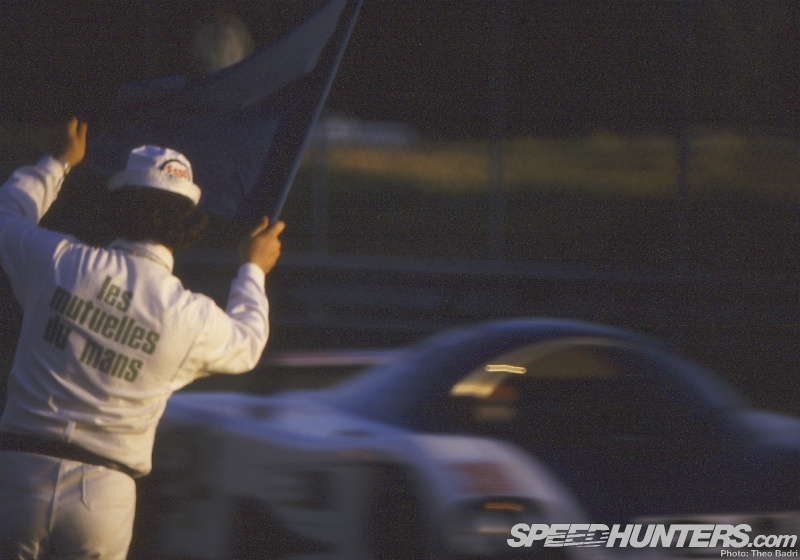 Ickx’s seventh Le Mans victory was looking unlikely in 1985. A faulty Motronics ECU for the #14 Canon Porsche dropped it back three laps to 7th, meaning the pair of British drivers would face a tough fightback for the rest of the race. Come dusk at 10pm there had been a relatively low number of retirements compared to previous years. 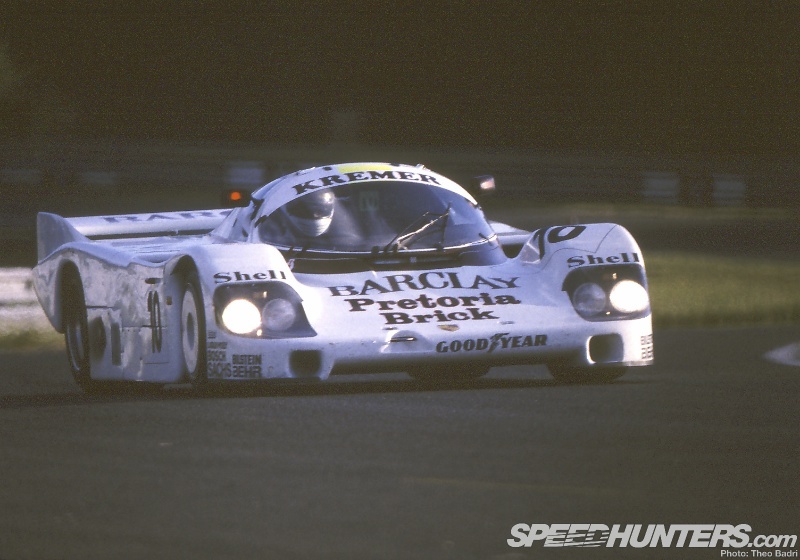 That said, fuel pump problems for the C2 Ecosse had become terminal after setting new C2 lap record; the Cheetah Aston shed a wheel at Indianapolis; the Kremer Porsche lost five laps with clutch cylinder failure and even Derek Bell in #2 had suffered a puncture but was still running close to #3 after six hours. 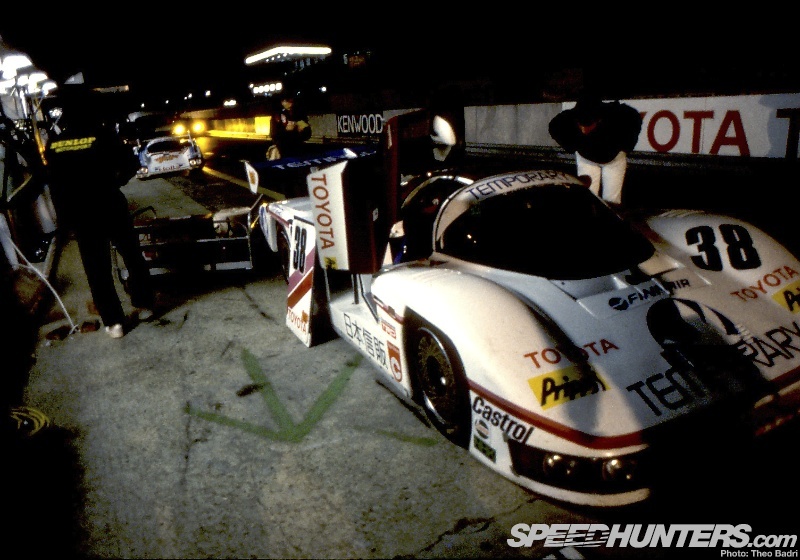 The Toyotas had mechanical problems despite sticking to an economy run that put them behind the fastest C2 runners, and both 85Cs were outside the top 20. 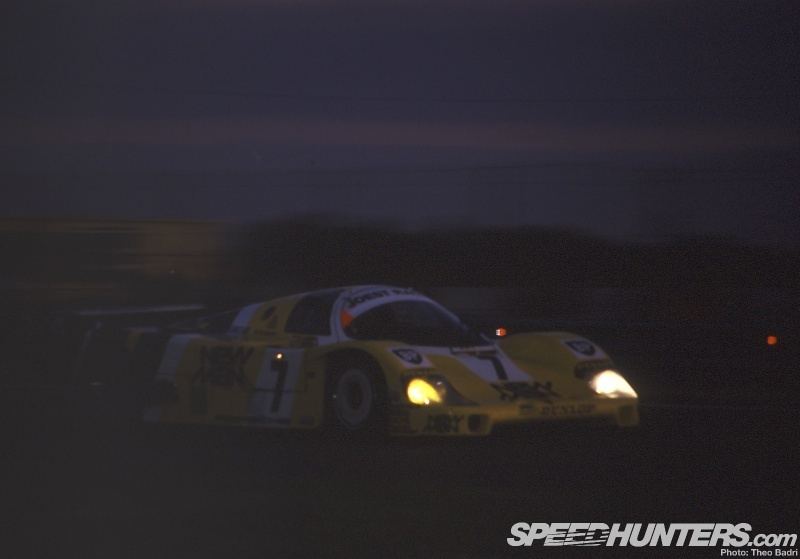 The #7 New Man Porsche was still pulling away now it had dropped its closest contenders, but as darkness fell the Porsche factory showed ominous signs of progress, with #3 into second and #2 third come midnight. The top 12 were covered by only four laps, so nothing seemed certain this early into the race. 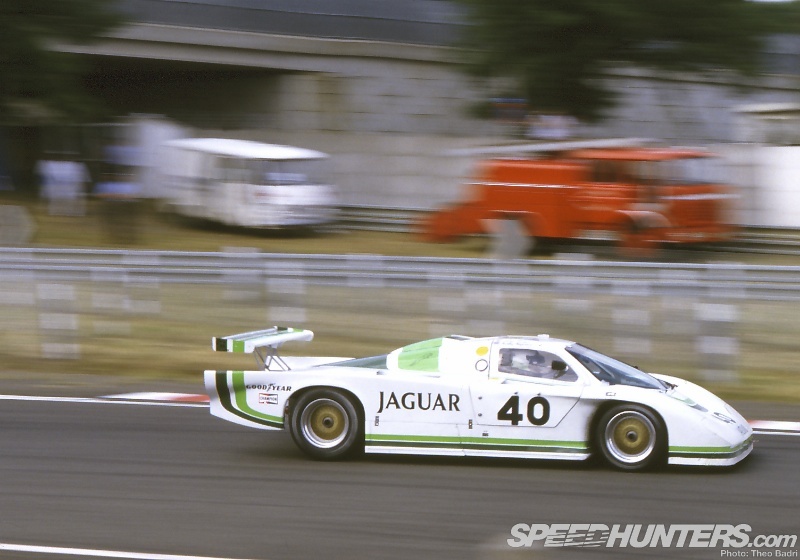 One Jaguar was knocked out when #40 had a driveshaft failure after 10 hours, and then a second Rothmans Porsche hit trouble: #2 suffered a second wheel-bearing failure and fell back by a number of places. This had followed a completely unexpected problem for a number of cars around 1:15am: an official had accidentally turned off one of the centrally-controlled fuel feeds, cutting off the pumps to several teams in the pits! 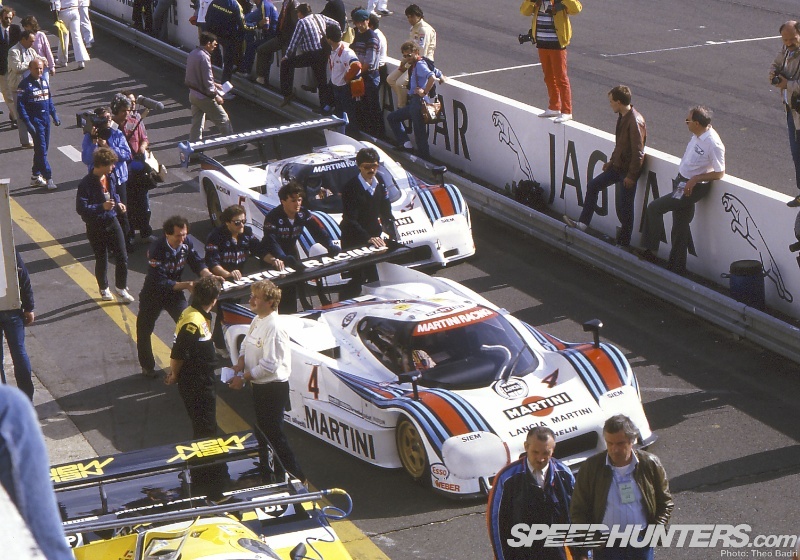 This included furious Lancia, RLR Canon, Brun and Fitzpatrick squads, who were allocated distance credits on track to make up for time lost in the pits. Lancia were further set back by a stone damaging the turbo wastegate of Wollek’s LC2, dropping #4 from 4th to 12th, but both cars were still circulating strongly – to everyone’s surprise. 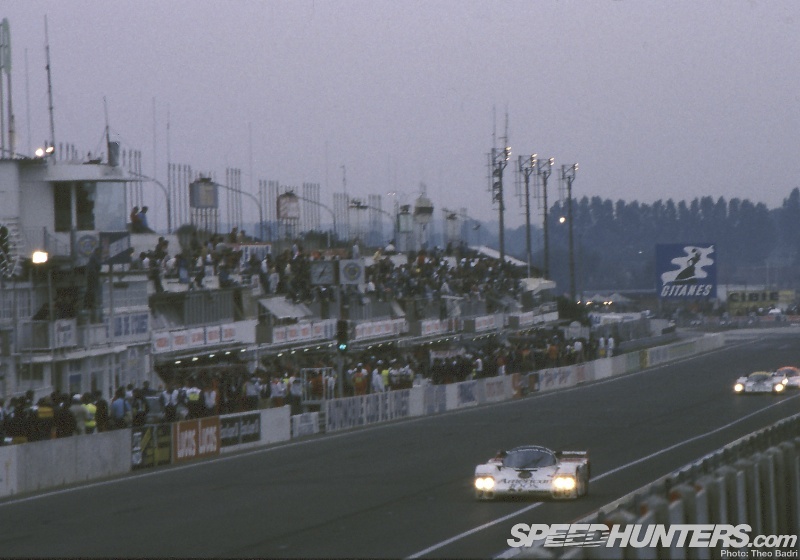 As the sun slowly rose over the Circuit De La Sarthe, the Ludwig/Barilla New Man Porsche (‘John Winter’, #7’s third driver, had driven a single short stint and then handed over the rest of the race to his more experienced team-mates) continued to inexorably circle the track in the lead. Its pace had startled everyone – including the officials of the ACO, who even raided the team at one stage and poured over their refuelling rig and equipment. 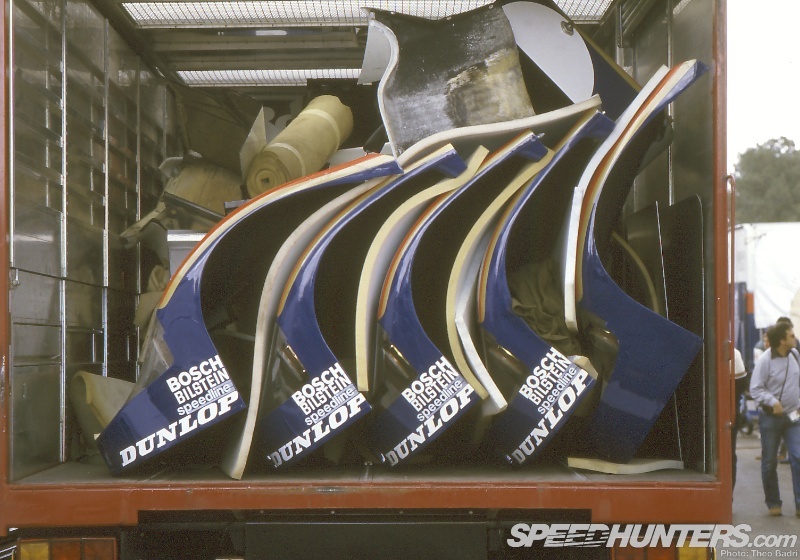 But it was all in order – the Joest team were simply better than the rest in 1985, as they had been the previous year. 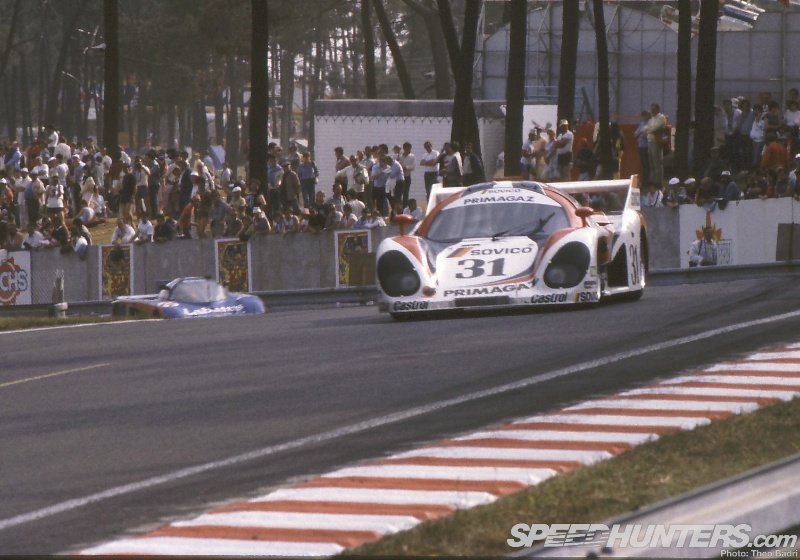 The trio of Porsche factory cars were running together come dawn, though laps apart and with only #3 in contention in second place, a lap back. The British Canon Porsche continued its storming recovery drive, closing in on #3 for second, the EMKA Aston was still going strong (people wondered what might have been possible given an all-pro line-up) and the Mazdas seemed set to finish well in C2. Ludwig and Barilla kept up the pace using a canny strategy of slipstreaming other cars wherever possible in order to turn down the boost (even deliberately running in an agreed tandem with the Canon car until it had hit problems), and no other car seemed to have the pace to catch them unless they were willing to gamble their fuel strategy. Some kind of failure seemed the only possibility, despite seven hours remaining. The traditional morning newspaper Le Maine Libre showed the traditional bingo card of retirements, the surprisingly low figure of 14. Small niggling problems had befallen teams, rather than the catastrophic failures that often occurred in such a tough race, and thankfully crashes had been minimal. 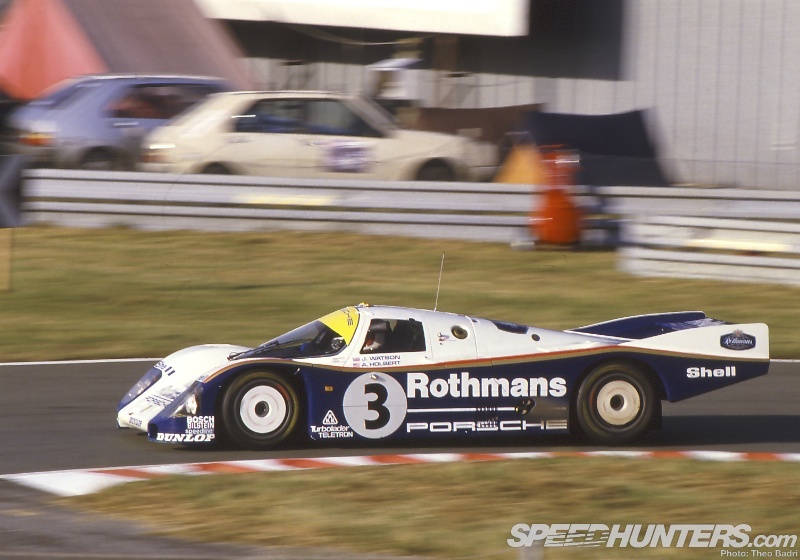 The third blow for Rothmans Porsche fell around 10am, when the #3 Porsche suffered a crankshaft failure. 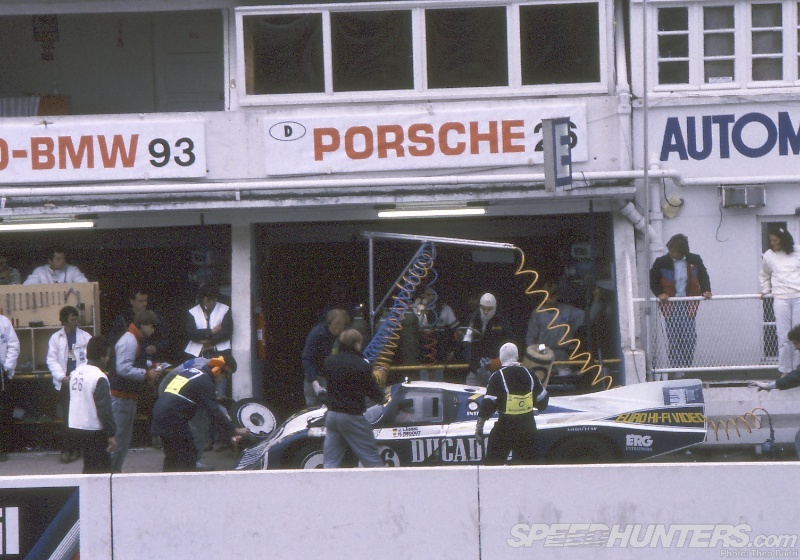 Watson limped the car back to the pits and into retirement – only the second Porsche engine to fail in three and a half seasons. Palmer took the #14 Canon Porsche back into second place, and carved anything up to 10 seconds a lap out of the leading New Man car. But #7 just kept going, relentlessly, unmoved by the hare that chased it. A final scare came just before midday when the Brun 962C barrel-rolled to destruction down the Hunaudières straight, taking the car out of sixth place, its driver again emerging unscathed. The second Brun 956 retired with engine failure soon after, a bitter blow for the team, but it allowed the Lancias and #3 Porsche to further up into the top 10. From then on the leaders counted down the laps, passing those cars who were struggling just to make it to the finish: a grinding WM, a Jaguar down to 11 cylinders, the EMKA Aston with fuel issues and a soldiering Kreepy Krauly March. 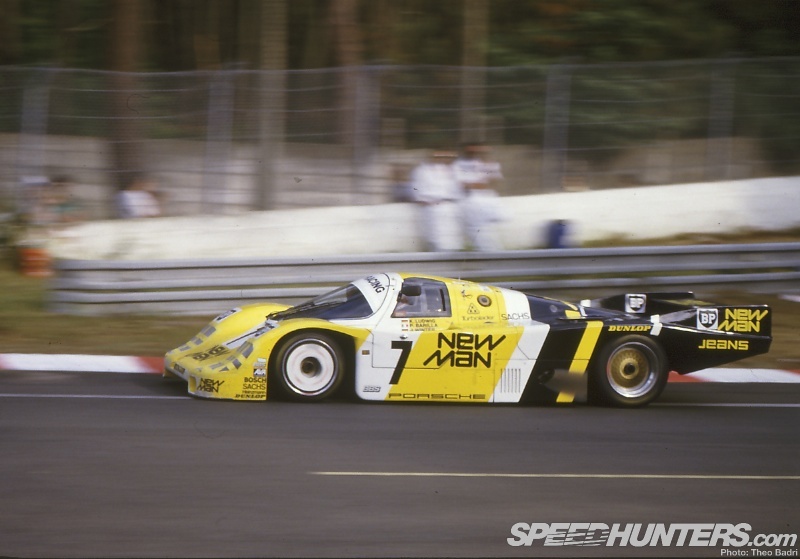 But at 3pm the #7 New Man Porsche 956B, with double-winner Klaus Ludwig at the wheel having driven well over half the race, led the survivors through the Ford Chicane for the last time in the middle of an ecstatic crowd, hooters and waving flags. 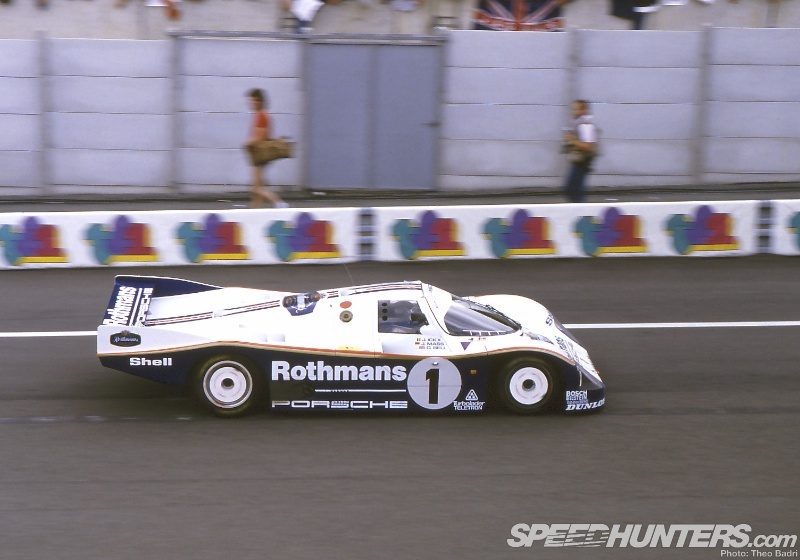 Not only was it a back to back win for Ludwig and the #7 car, but they’d also set a new distance record (24 hours, 373 laps and 3,161 miles at an average speed of 131.745mph, still with 100 litres of fuel left unused) and taken Porsche’s tenth win at Le Mans, beating Ferrari’s total. There’s a story that Joest’s team boss was ironically offering to sell fuel to rivals towards the end of the race! Behind him was a very happy #14 Canon crew (three laps back on the charts with 30 litres left, whose two trivial problems had cost them a shot at victory), then Stuck and Bell in the #2 962C, a pair of privateer 956Bs and the two LC2s – who had made it through the 24 hours after realising that raw speed wasn’t going to cut it. The Spice Tiga took C2, finishing 14th overall (just in front of the leading Group B BMW M1), the Sheldon #75 Gebhardt second in class and the #86 Mazda third. 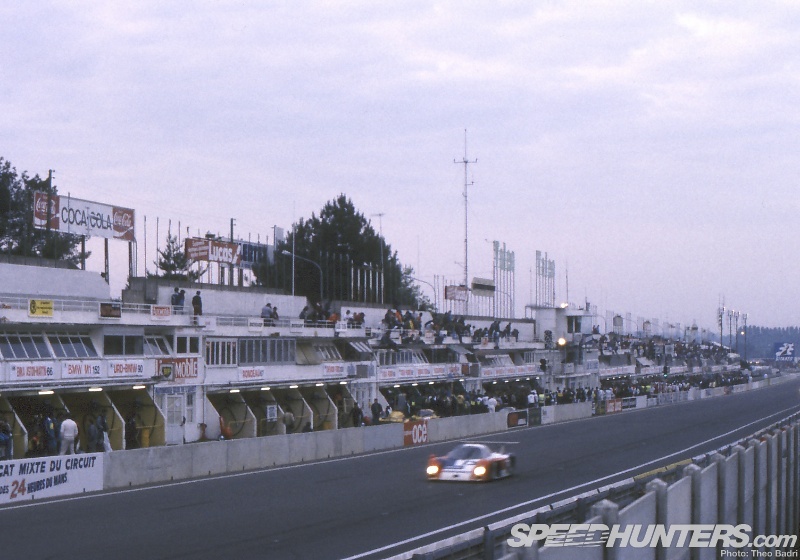 The all-Japanese Toyota crew in #36 finished a very respectful 12th, sandwiched by the remaining Jaguar and the EMKA Aston, making it the first Japanese car to finish at Le Mans. The race had ebbed and flowed for its first third, before the shock of Joest’s efficiency was rammed home to everyone else – and in particular the works Porsche and Lancia teams. 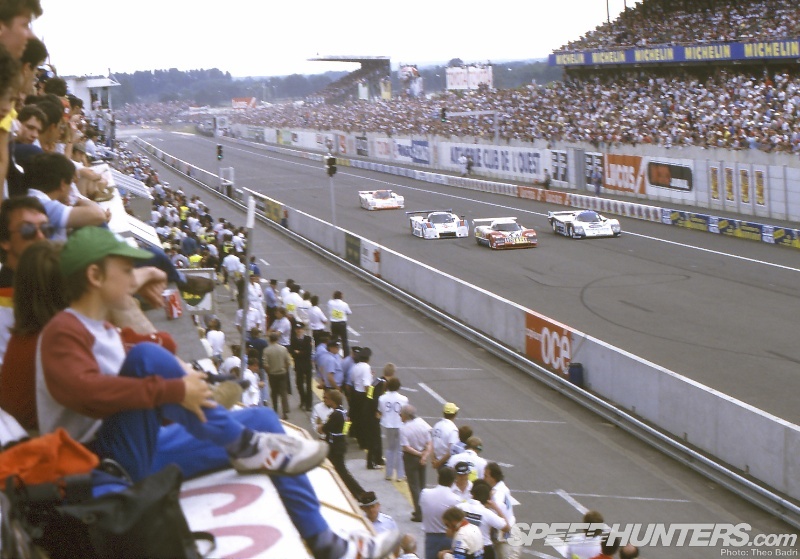 Le Mans 1985 highlighted just how successful Porsche’s customer programme was: the factory might not mind privateer cars beating them, but they certainly never enjoy it… Despite the result, the works Porsches still scored important points towards the 1985 WSC, and Ickx and Mass left the track still at the head of the table. 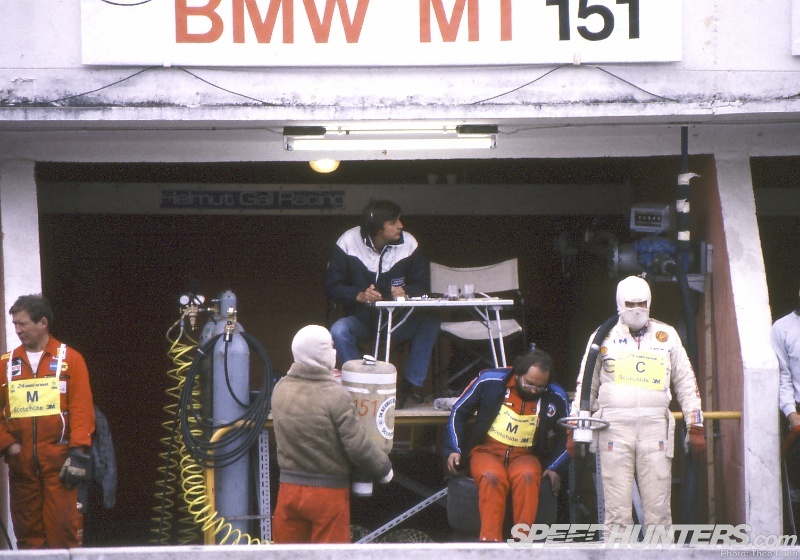 Stuck and Bell would win the next WSC round at Hockenheim, going on to become joined World Champions for 1985. 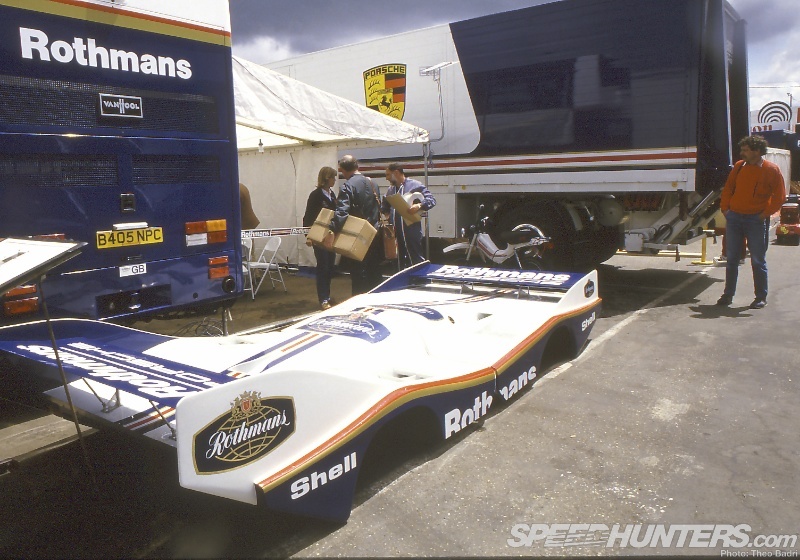 The next year would see Rothmans Porsche bounce back, with Bell/Stuck/Holbert winning in a 962C – and another six 956/962s in the top 10 (plus a 961 and 936 for good measure!). 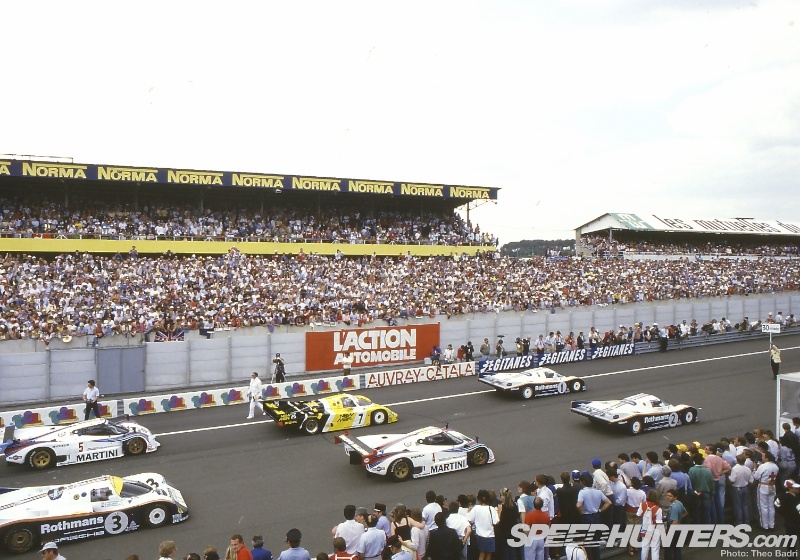 ’87 would see a reversion to classic Le Mans: complete meltdown of the entry, with only 12 classified finishers but another 962C win; ’88 the legendary Jaguar XJR-9LM victory; ’89 the Sauber C9s smashing the opposition. Again. You've made my morning Jonathan! Great read. I own quite some books on Porsches Motorsport-History but this article was by far the most thrilling on the season '85. Huge credt to Mr. Badri for his excellent pictures as well. @maxproof Absolutely - there wouldn't be this article without his incredible archive. oh. my. gawd. you just made my day Jonathan! the way you wrote this article made me feel like i was there in the grandstands the whole race! best speedhunters article for me. ever. all those 956s and 962s. sweet! Thanks for the story. Gripping to the end. 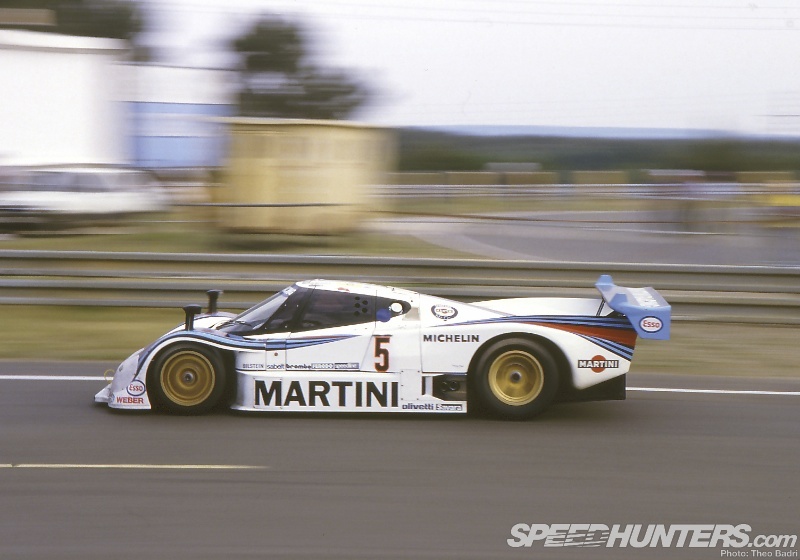 Great article, 80's cars, especially Group C cars, are some of the best racers ever made. Whether they were Porsche Jaguar, Lancia, Sauber, Peugeot, or the great Mazda 787b, all of them were great racers and iconic cars that make people drull just to look at a picture of them, let alone see one in the flesh racing around some of the greatest circuits of all time,( not the new ones were all the corners are the same, they only change positions on the track). I need a time machine to get back in time. Thank you Jonathan. Thank you Speedhunters. *sigh* racing peaked in the 80's... I love seeing these cars at vintage festivals, they're so incredible! Absolutely fantastic article. Great writing, great pictures, great data. It's nice to get a break from all the modern-era coverage and get this articles that give us youngsters a nice account of what happened in legendary races! Thank you Jonathan for this amazing piece of work. I grew up in the eighties but alas was to young to really appreciate the glory of it all. I wish I had been a bit older at the time and had it really soak in. What can I say the cars were better looking the racing was better. Man o man what good these day were. Awesome article. I miss those days and I miss Group 44. 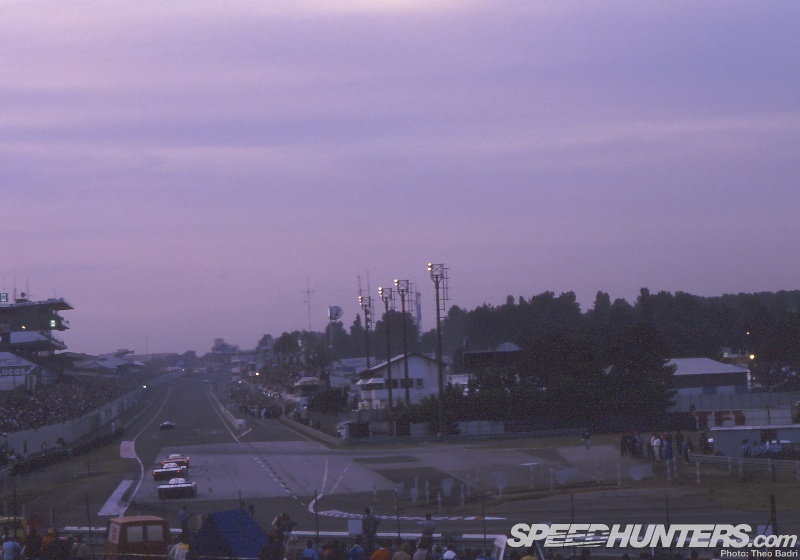 I grew up just outside of Mid-Ohio Sports car course and used to go watch The Imsa GTP and Camel Lites series with my Father. My current license plate is GROUP44. No one knows what it means.